John Linko | Notes from the journey. In God We Trust, all others we monitor…. The opinions expressed in this weblog are solely my own as an individual and private citizen, and do not represent the opinion or policy of my family, my employer, or any other private or public entity. It’s been gnawing at me that over 6 months have elapsed since my last post, but it seems that I can’t step away from other responsibilities, reduce other demands on my time, or set aside enough time to write. What I did do was what I always do, sometimes to distraction, other times to fascination and enlightenment – observe, monitor, and in one instance, participate – and now I get to report…again. That I am finishing this post from a hospital bed is proof enough that changes are afoot – literally and figuratively. In July 2017, my attention was drawn to news reports announcing the construction of a new rehabilitation facility on the HealthSouth campus in Leet Township, to be owned and operated jointly with Heritage Valley Health System. This construction has been well underway for some time – along the way HealthSouth merged into Birmingham, Alabama-based Encompass Home Health to become Encompass Health. This has resulted in yet another name change for this historic facility. With the knowledge that this existing building had once housed the former D.T. Watson Home for Crippled Children (now the Watson Institute), I had a conversation with Harton Semple, President of the Sewickley Valley Historical Society, concerning the Watson Home, its historic significance, and how that might be properly commemorated. 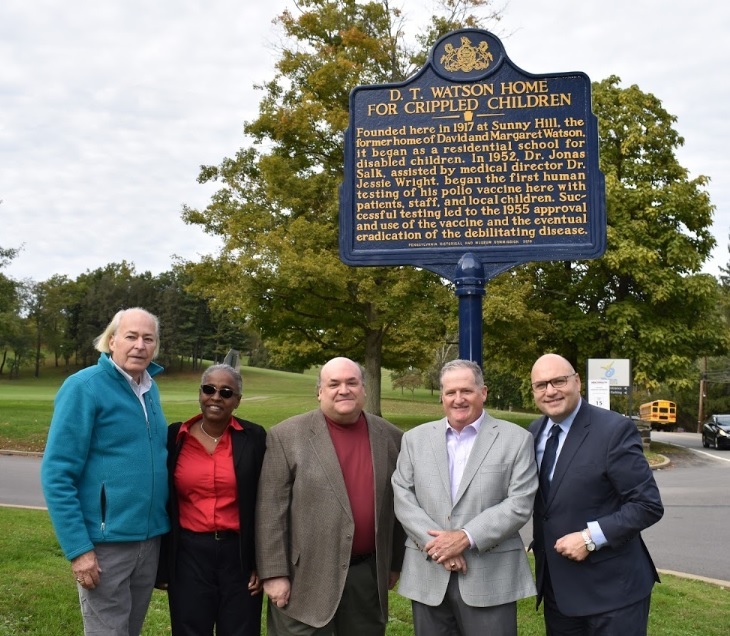 Armed with some basic research and the encouragement of Mr. Semple, I began collecting information to address the nomination requirements of the Pennsylvania Historical Marker Program. These markers are designed to recognize subjects, locations, or events that “had a significant impact on its times, and has statewide and/or national, rather than local or regional, historical significance”. In the immediate Quaker Valley area, there are two other state markers; one in Edgeworth honoring composer Ethelbert Nevin, and the marker at the Harmonist settlement at Old Economy in Ambridge. With Leslie’s help I was able to get a comprehensive application packet submitted by the December 1 annual deadline. After receiving the news in March 2018 that the marker had been one of 18 approved that year, work began on getting the marker funded (no state funding is budgeted for this), and address the legal and procedural issues related to placing the marker and dedicating it. Both the Watson Institute and the Sewickley Valley Historical Society made the commitment of financial and human resources to make this happen during the 2018 calendar year. The marker was dedicated at a small ceremony on October 19. The placement of this marker is admittedly a small feat when compared to the possibilities and realities that were leveraged decades ago to eliminate the fear and suffering brought about by polio. The extraordinary generosity of a man and his wife. The painstaking effort of those who toiled to provide care, education, and rehabilitation to the victims of polio, as well as those who sought to conquer it, and worked together as scientists to accomplish that end. The willingness of a community to step forward, and whose participation played an essential role in achieving that goal. Recent news reports indicate that there are new challenges to the health and well-being of our children, whether by an uptick in cases of a rare malady that mimics the symptoms of polio, or by the resurgence of old diseases in places where concentrations of parents have declined to vaccinate their children. For me, all I need to know about the credibility of the anti-vaxxer movement can be answered by the actions taken by physicians, parents, and children in our local area over 60 years ago. The lessons learned from those whose accomplishments helped to conquer polio will serve us well when addressing these and future challenges to our society’s quality of life. It’s a rare thing for a community to be able to look at a specific time or place in their history and say that the world was changed for the better because of it. I’m grateful to have been able to participate in recognizing such an achievement in a permanent, visible way. The nearly 25-year tenure of Kevin Flannery as Manager of Sewickley Borough was, by my limited recollection, a distinguished one. Mr. Flannery began his tenure in 1993, around the same time I was dispatching part-time for several local police departments, including Sewickley. Upon my return in 2011 after 16 years out west, Mr. Flannery was still in Sewickley. He had, from my vantage point, firmly established some administrative processes that led themselves to enhancing the accessibility, accountability, and transparency of local government. Examples include leveraging the PEG channel on local cable TV with informative programming of local interest – I remember a particularly interesting program on Sewickley’s sewage treatment plant – and taking a leadership role in multi-agency coordination with the planning of numerous community events, which included the inexplicably thorny business of Landing Zone procedures. He also established the borough’s online presence, which is a comprehensive example of effective information distribution about a community and its government. So after 25 years in a position not known in many places for lengthy tenure, it wouldn’t be surprising to see Mr. Flannery want to step away from a distinguished career and take it easy for a while. Within a month, however, Mr. Flannery was reported to be back at work as the interim manager in Oakmont, which he then concluded at the end of last year to become Hampton Township’s Director of Community Services. Is it possible that Mr. Flannery found it necessary to leave Sewickley before he was ready? His accepting other employment immediately post-retirement would certainly suggest this. The borough’s operations have also seen their share of change, tumult, and controversy over the last year or two – witness the Zamagias Condominiums / Character Matters controversy, the resurrection, death, and re-animation of the Parking Authority, the withdrawal from the Quaker Valley COG, and perhaps most telling, the commencement of negotiations to move sewage treatment to Leetsdale. Council President Jeff Neff is quoted by the Sewickley Herald that the current borough council “is a new council with new insight”. It’s a good question as to whether they also felt the need for new insights in management. President Neff also alluded to the need for effective succession planning (which seemed painfully absent here) when speaking to the Herald in mid-March about the two women hired to assume oversight of day-to-day borough operations. The coming weeks and months will likely see reorganization anew, as Marla Marcinko and Erin Sakalik begin their duties as Manager and Assistant Manager respectively. One item on what is likely a long list of processes to be evaluated concerns the borough’s response to the excavation and construction of a driveway as part of the redevelopment of properties along Hill Street and Hopkins Street, in what is known as a Natural Resource Protection Overlay zoning district. The Sewickley Zoning Ordinance defines this designation as “intended to mitigate potential hazards, prevent potential impacts on the region’s water and stream quality and protect private property from potential damages that may occur due to the uncontrolled development of lands with sensitive natural resources”. This includes the steep slope that the neighborhood is built on. This ongoing controversy involves not only the borough’s code enforcement and monitoring of construction activity, but also the manner in which the borough conducts business, and documents the activities of its ancillary boards and commissions. I’ll have much more about this issue in the weeks ahead. 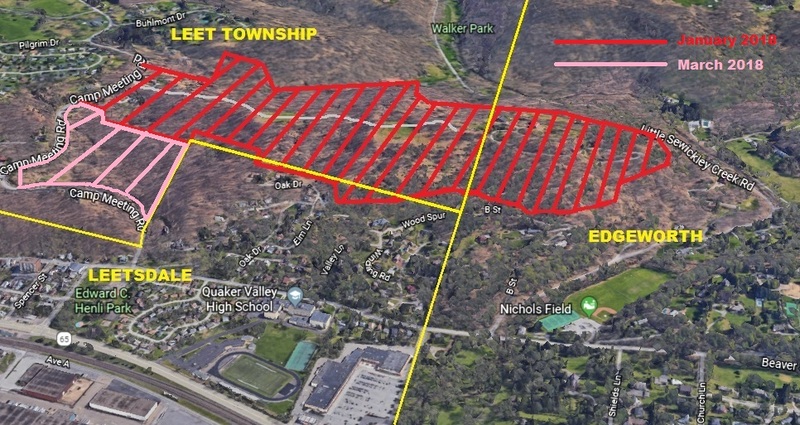 In my post of last September, I detailed the ongoing zoning dispute and litigation between Sewickley Heights Borough and the owners of Dundee Farm and Fields on Scaife Road. This became more than just your average zoning issue because the owners, Scott and Theresa Fetterolf, elected to play the First Amendment card in Federal court, asserting that the borough’s attempts to curtail the use of their property for various activities without the required variances violated their rights to the free exercise of their religious beliefs. The matter of the notice of violation issued by the Defendant concerning the zoning matter at issue is presently pending proceedings before the zoning hearing board. A final decision from that board has not yet been issued. According to Borough Manager Katie Stringent, that decision is scheduled to be announced at a public meeting on April 25. The published meeting notice seems to make a point of stating that “the Board will also consider any other matters that come before the Board” and “The public is invited to attend and participate.” Considering the comments from nearby residents that were reported in the Herald of November 8, it’s possible that the session will be a lively one. The fallout from the result of the Michael Rosfeld trial in March, while somewhat predictable given the nature of state law as it pertains to the use of force, has nonetheless caused a ripple effect in the civil courts, newsrooms, and municipal halls across the county. Last December the Post-Gazette focused much attention on the inequalities and fragmentation resident in the overwhelming number of independent municipal police departments in Allegheny County – the most of any county in the state. Along with the December dissolution of the East Pittsburgh Police Department, they and three other neighboring municipalities have requested an evaluation from the state as to the feasibility of consolidating their departments into a single police force. Post-Gazette graphic showing Mon Valley municipalities considering consolidation. These evaluations don’t always turn out the way you might think, depending upon the priorities established by the stakeholders involved. The four communities in the lower Allegheny Valley that requested the same evaluation got the report back stating that consolidation wasn’t feasible without significant layoffs – something that the towns involved didn’t want. Here in the Quaker Valley, the possibility of a significant tax hike to pay for a new high school may force local municipalities to re-evaluate those parts of their operations that take up the largest portion of their budgets. Police protection is often at the top of the list. Studies of police consolidation invariably have a political as well as fiscal component associated with them. One recommendation that I have read in the past is that tying a consolidation to the retirement of one or more of the incumbent leaders can often help to smooth the transition. The announcement in March of Leet Township Police Chief William Wanto’s upcoming retirement could represent an opportunity to begin discussions. Leet, Leetsdale, Bell Acres, and other area police work together on a routine basis. Why should these expensive and essential resources be administered by multiple separate entities? We can do better, or at least should take a serious look to see if we can. I’m hopeful that there are municipal officials that consider efficiency and fiscal responsibility as truly desirable and attainable goals. In my last post I reported on the slaying of Leetsdale native Dulane Cameron Jr. outside a bar on Pittsburgh’s North Shore. The suspect, Joden Rocco, is still incarcerated pending trial. Allegheny County District Attorney spokesperson Mike Manko stated this month via e-mail that the “case is currently on appeal. I have no other timetable for it at this point”. Another local connection to the unrest last summer is the charges filed against Bell Acres councilor Gregory Wagner for allegedly striking protesters with his Mercedes, also on the North Shore. According to online court records, most of the charges against Mr. Wagner were held for trial. A pre-trial conference is scheduled for April 18. 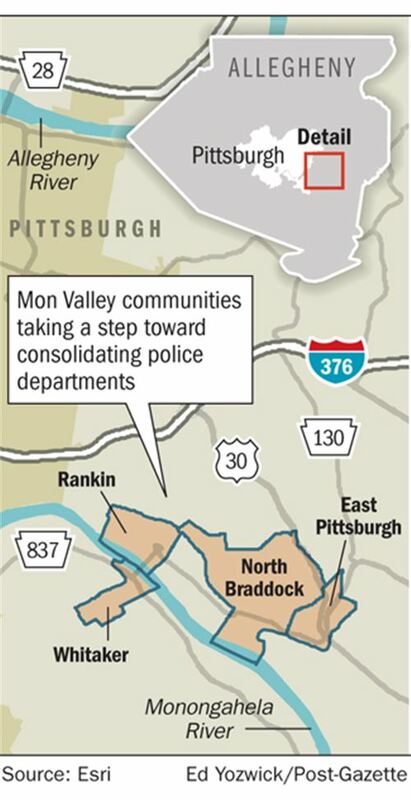 The above graphic from the Post-Gazette showing the Mon Valley towns discussing police consolidation has a big hole where Braddock Borough should be. Regardless of the reasons for this, those with statutory authority over the police department there need to be proactive about this as much as their neighbors seem to be. The interesting thing about this is for 14 years up until this past January, that person was the Mayor of Braddock, John Fetterman, now Pennsylvania’s Lieutenant Governor. According to Wikipedia, “The position’s only official duties are serving as president of the state senate and chairing the Board of Pardons and the Pennsylvania Emergency Management Council”. The position of Mayor in Pennsylvania is similar, in that a mayor’s primary responsibility is oversight of the police department. Mr. Fetterman has distinguished himself as a community activist and booster for the Braddock community. He is fortunate to be of sufficient independent means to be able to focus on those ideals while pursuing his activism and political office. In some ways he reminds me of Eliot Rosewater, a character in at least one Kurt Vonnegut novel. As someone who considers public safety and emergency management as the most critical services that a government can provide, I can’t help but think he may have left the police department to its own leadership, rather than encourage innovation and efficiency during his tenure. I’m hopeful that Mr. Fetterman will aspire to all of his new duties with the same passion and energy as he did as a community activist in Braddock. Unfortunately, I can’t help but think that he may instead use the office as a bully pulpit – witness the marijuana legalization listening tour. I’m hopeful for Mr. Fetterman’s success, but perhaps more hopeful for Tom Wolf’s continued good health during his second term. When the Lubrizol Plant burned in November 2015, the safety contingencies in place for residents and employees within Leetsdale’s industrial district came under public scrutiny and comment – and rightly so. Review of recent Leetsdale council minutes shows that conversations are still taking place to possibly restore an existing bridge over Big Sewickley Creek between Port Ambridge Industrial Park and the Hussey Copper property, for use as a secondary evacuation route. As it happens, Hussey’s interest in this may be bolstered after three significant incidents at the plant last fall, requiring a considerable public safety response. According to Leetsdale fire officials, Hussey paid to have several sets of firefighter protective gear from several local departments get specialized professional cleaning due to soiling from the suppression efforts and overhaul. Four days later on October 2, fire crews returned to Hussey for a “working fire found in an electrical room off the main work area with extension up the exterior wall and roof of the plant“. Finally on October 21, an overspill of molten copper required fire units to assist with cooling it down so that the company could start the cleanup process. KDKA-TV reported the first and second fire incidents, and were the only local media outlet to report anything at all about these occurrences. This is further evidence of the continued deterioration of local news reporting by the traditional mainstream media. Some stories like the fires at Hussey are of interest to the community at large, and speak to significant issues that have consequences for multiple stakeholder groups. One has to wonder what is next to fill the gap in local journalism that covers significant issues of importance to residents. Best wishes for a tranquil transition to mid-spring. After a June that was rainier than usual, July and August brought with them the kind of sticky, unpleasant, hot weather that becomes annoying quickly, especially when the car air conditioner isn’t working. There is reasonable certainty of relief from the seasonal effects of our literal climate. Whether or not the climate of conflict that seems to be pervading a great deal of our society will moderate at all is definitely up to interpretation. This is amplified when considering the examples being set as an excuse for leadership at the highest levels of government. This corner focuses on local issues for the most part, so examples of local governance that rival the travesties in process at the federal level, or show foresight and intelligence in addressing local problems, tend to draw my attention. Here are some examples. The officer-involved shooting of Antwon Rose Jr. in East Pittsburgh Borough on June 19 wouldn’t normally be something I spend time writing about. I usually don’t find myself coming up with anything that cuts a different path from the anguished and passionate voices that have arisen in the wake of this incident, and the too-numerous ones that have preceded it. It’s a little different this time. My experience in public safety has taught me the potential dangers of armchair quarterbacking a response, and I resisted any such activity. Instead, I waited for the District Attorney to release his findings and recommend action. Which he did. Mr. Zappala’s announcement that the officer involved would be criminally charged was accompanied by public criticism of the status quo that is rare for an official in his position. In response, local politicians have proposed legislative efforts to impose training and information gathering standards on the state’s police departments. County Council has voted to begin the process to establish a countywide citizen police review board, even in the face of objections from the law enforcement community. As the Post-Gazette’s Brian O’Neill observed, the weirdness of Pennsylvania law itself presents challenges to the effectiveness of this endeavor. By late August, at least two municipalities in this area were debating the future of their police forces, with the P-G encouraging a similar fate for the distressed department in Aliquippa. Things are also not so stable in nearby Ambridge. Mr. O’Neill also brought forth some of the gritty realities of the situation in a July 2 column, where he sought to gain some understanding about the incident, and what’s to come, from the point of view of a sort of pulse checker for the African-American community. I’m hoping that efforts at reform don’t stop here. Many lapses in professionalism and efficiency have at their core the archaic system of governance in Pennsylvania that allows for the existence of political subdivisions that are often too small, duplicative, and parochial to respond effectively to the demands made of them. The Pittsburgh City Paper, in an excellent June story, also focused on these issues as framed by the Antwon Rose incident. Municipalities like East Pittsburgh and others are likely to face serious choices as this trend of increased oversight, regulation, and citizen demand for accountability continues. Their viability as independent municipal entities may even be in jeopardy – and I’m pretty sure that’s not such a bad thing. The fallout from the Rose shooting has reached into other areas of the county, mainly from the protests that have abated somewhat since late July, but were often conducted in a manner designed to be highly visible and disruptive. This practice, and one man’s alleged decision to drive through the protesters, helped bring the debate to the doorstep of the Sewickley Valley. The July 9 meeting of Bell Acres council probably drew more attention from non-residents and the media than in the borough’s entire history, even if the councilman in question chose to stay away. Court records show that the preliminary hearing on the charges filed against him has been continued until November 15. I believe that the protests will continue in some consistent, persistent manner until the protesters’ vision of justice is served. For many that means a criminal conviction and a punishment of significance for the officer involved – and maybe the councilman, too. Closer to home is the recent death of Leetsdale native and QVHS alumni Dulane Cameron Jr., as the result of stab wounds sustained outside a North Shore tavern on August 19. Additional media reports indicate that the male suspect in custody had made social media posts with racist overtones, leading to calls for additional investigation of the incident as a hate crime. Family members also spoke out about the likely racial foundation behind an act of rage and recklessness, which tears at the fabric of all families, and society at large. My thoughts are with all of those touched in some way by these tragedies. In the wake of the potential consequences to local governance brought about by the Antwon Rose debacle, the unanimous decision in June by Sewickley Borough Council to leave the Quaker Valley Council of Governments was a surprising development. I received no reply. A follow-up e-mail to Ms. Hockenberry in late July also received no reply. For their coverage of this, the Herald reporter attempted, with a little success, to get some answers about the specific reasons for a separation that on the surface appears counterintuitive. The reported $3,300 annual COG membership fee represents about three tenths of one percent (0.3%) of Sewickley Borough’s budgeted General Government expenditures, according to the borough’s 2018 budget document (Page 23). Additional information from that document indicated that Sewickley has provided road salt storage and loading services for Glen Osborne, Glenfield, Haysville, and Sewickley Hills. In the Borough Manager’s Report for June it is mentioned that Sewickley has notified these municipalities that this service will be discontinued. Some of the COG’s accomplishments in support of its de facto mission statement may not translate to immediate, tangible results, but may become a foundation for more efficient provision of essential services by participating entities. Examples include educating the community on stormwater management, exploring the feasibility of municipal solar energy projects, participating in a study geared toward remaking Route 65, allowing participating municipalities access to a suite of Geographic Information System tools, and facilitating a comprehensive audit of the area’s Emergency Management programs. One municipal official I spoke with stated that without an increase in membership fees the COG’s financial stability may become an issue in the future. The membership was also not united in embracing the hiring of Ms. Hockenberry, as evidenced by the July 2016 COG board meeting minutes (Page 4). Administrative payroll costs appear to make up just under 70 percent of the COG’s 2018 draft budget. The business of local government appears to be more complex and challenging than ever before. While prudence in the management of resources is a positive long-term strategy, the same can’t be said of stepping away from opportunities for collaboration to assure that citizens being represented can share in a common good – irrespective of those pesky imaginary lines that we divide ourselves with. When signs popped up at the entrances to Leetsdale’s Henle Park in early June stating that the park’s popular splash pad feature would remain closed until further notice, a lot of collective heads across the borough were being scratched. After the Herald reported on the reason why, social media began to light up with lively discussions about the disagreement between the borough and the Leetsdale VFW post, who was right or wrong, and whether or not the borough should support the VFW in some manner, given what appeared to be a congenial relationship over decades. My biggest concern as a local resident focused on why the splash pad remained closed just because of a perceived parking issue. Leetsdale Borough offers its community room in the municipal building for rent, and allows businesses to operate in residential areas, without adequate dedicated off-street parking. This results in patrons and event participants utilizing on-street parking spaces, often to the chagrin of nearby residents. If these activities can take place without apparent concern for parking, why couldn’t the same apply to the splash pad? This smacked of a double standard. This point and others were apparently made to the borough offices and elected officials, so much so that the borough quickly relented and opened the spl ash pad 2 days after its planned opening date. The borough then expanded splash pad hours to 5 days from the previous 4. What doesn’t seem to make sense is the way the decision to close and then reopen the splash pad appears to have been arrived at. Initial Herald reporting about the closure and negotiations with the VFW included comment from Mayor Pete Poninsky. After the borough reversed course, the Herald sought out Mayor Poninsky for an explanation, only to have him state that he had been out-of-town. There was no apparent referral to or contact attempt with other borough officials, and it remained unclear who had assumed command over the issue in the Mayor’s absence – or even who has responsibility over day-to-day borough operations. This is a recurring theme for Leetsdale, the largest of the 5 Quaker Valley area municipalities that do not employ a borough manager. One of the advantages of a competent manager is providing a sense of continuity, accountability, and foresight – such as addressing dedicated, off-street parking when planning new facilities. When done well, citizens can benefit from service provision that echoes these same values. The importance of a consistent management presence can be critical, even in municipalities whose operations seem to appear bucolic and tranquil. Consider recent events in Sewickley Heights. For over a year, the borough has been engaged in a dispute with Scott and Theresa Fetterolf, owners of Dundee Farm and Fields on Scaife Road, over their use of the property in ways not in keeping with the borough’s zoning ordinance, and for failing to apply for any variance from the borough to conduct those activities. For most of this year the dispute enjoyed sporadic coverage in the local media, possibly due to a lengthy hearing process before the borough’s Zoning Hearing Board, and the reluctance on the part of both sides to comment outside of those proceedings. This changed drastically in mid-July, with the Post-Gazette reporting that the owners would be appealing the borough’s cease-and-desist order. This was followed by the Tribune-Review reporting that this appeal had taken the form of a federal lawsuit3. The attorneys for the owners in this federal action are part of the Independence Law Center, an affiliate of the Pennsylvania Family Institute, which describes itself on its Facebook page as “Pennsylvania’s voice for families – protecting life, marriage and religious freedom”. As part of the complaint, these attorneys also referenced a “tradition” established by the previous owner of the farm, the late Nancy Doyle Chalfant. Mrs. Chalfant was known to open her home to church groups and others, owing in part to her benchmark involvement in such local institutions as St. Stephens Church, Trinity School for Ministry, and the Verland Foundation. This action set off a barrage of online media attention, particularly among religious advocacy groups and media websites that focus on stories related to religion and the free exercise thereof. A deeper look into some of the proceedings surrounding the owners’ appeal to the zoning board reveals a more contentious dispute than previously reported. From October of last year to March of this year, the borough and the attorney for the owners were involved in a dispute over a considerable document request made under the state’s Right to Know Law. This dispute resulted in an appeal1 to the state Office of Open Records, which ruled in favor of the borough’s request to withhold certain records that contained privileged information. In March, the Zoning Hearing Board issued an administrative subpoena to the owners and their associated business entities, requiring their personal appearance and the provision of records pertaining to their various business activities. The borough then petitioned Common Pleas Court2 to enforce the subpoena, alleging that the owners had not complied with it and had no intention of doing so. The owners then filed objections to the subpoena2 with the court, which included their assertion that to produce the documents subpoenaed or testifying about their business activities would violate their Fifth Amendment rights against self-incrimination. On July 6, Common Pleas Judge Robert Colville issued an order2 requiring the owners to comply with the borough’s subpoena within 30 days, and dismissed most of the owners’ assertions regarding the impact of the borough’s action on their Fifth Amendment rights. The owners’ federal lawsuit3, and subsequent courting of media attention, followed soon afterward. Contacted on August 8 regarding the status of Judge Colville’s order and any enforcement of it, borough attorney Alyssa Golfieri declined comment on any pending litigation. Initial reporting on the lawsuit by the Trib and KDKA-TV reporter Jon Delano appeared to swallow the religious freedom angle hook, line, and sinker. This may have been exacerbated by the lack of a substantive response by the borough or its attorneys. That changed on July 25, when the borough released a letter addressed to its residents. A copy of that letter, obtained via Right to Know request, is available to read here. I strongly recommend it. The letter’s release also appeared to force KDKA’s Delano to put together a follow-up story that provided better coverage of the borough’s position. This included an interview with Mayor John Oliver III, as well as comments received from adjacent, albeit camera-shy property owners. An August 10 Herald story also expanded greatly on the borough’s assertions, and provided the revelation that the federal court case is possibly headed to mediation. This may explain a return to silence on the part of attorneys for both sides, including the previously accessible lawyers from the special interest firm in Harrisburg. In mid-August the borough filed a motion to dismiss3 the federal complaint. The owners responded with a memorandum in opposition3 on August 28. In principle, I support the efforts of the owners of Dundee Farm to utilize their property as they see fit – within the processes established by the borough to accomplish that end. However, it appears that the owners have not seen fit to even attempt to go through what appear to be reasonable processes to obtain the necessary zoning variances and/or permits. In my youth, I benefited from the hospitality of Nanky Chalfant as a guest at her farm. I remember it as being with the understanding that my presence there was as a guest, or as part of a group of guests, at her private residence. This contrasts from what appears to be the primary focus of the current owners’ intentions for the property, as detailed by the borough’s investigation and reinforced by social media posts from clients, attendees and the owners themselves. The debate about overzealous zoning laws and enforcement is a timely one, and I have been an advocate of reasonable private property rights. Nonetheless I find the owners’ First Amendment argument to be somewhat disingenuous. The federal complaint appears to be an attempt to obfuscate the basic nature of the dispute – the right of the borough to regulate land use via zoning, and the owners’ apparent disregard for those requirements. Despite this, the property owner is entitled to a fair hearing, conducted in a legal, ethical, and timely manner. From my vantage point the borough has exercised due diligence to accomplish this, even if the process has been a lengthy endeavor. I can’t say the same for the owners of Dundee Farm. If mediation is to be where this dispute will be resolved, it may end up being tantamount to a victory for obstinate noncompliance, and a defeat for the rule of law. In the face of all this crap, there are things that give us hope. Love is at the root of everything. All learning, all parenting, all relationships. Love, or the lack of it. Among all the consternation this summer, there have been examples of the redeeming qualities of some corners of humanity. None has been more satisfying for me than the resurgence of the words, music, and legacy of Fred Rogers. This year marks the 50th Anniversary of his television program’s humble beginnings. In addition to that observation, there has been a commemorative postage stamp issued that sold out quickly in our area. Fred Rogers and his writings have been enjoying a renaissance of sorts as a result of this observance and commemoration, with a popular and acclaimed documentary now showing, and a new biography to be released this week. Still to come in 2019 is a theatrical film, You Are My Friend, with Tom Hanks playing Mr. Rogers. The film is based in part on a 1998 Esquire Magazine article by award-winning writer Tom Junod that chronicles his friendship with Rogers during and after his research and interviews for the article, which is well worth taking the time to read. Mr. Junod mentions one of Mr. Rogers’ finest moments on network TV, which would do you well to look at too. We in the Pittsburgh region are quite familiar with Mister Rogers and his Neighborhood, but like a favorite, comfortable piece of furniture the experience never seems trite, overdone, or boring. It’s just there, and we like it that way. Another fact that emerges in a subtle way is that Mr. Rogers, as an ordained Presbyterian minister, was charged by his church to spread the gospel via his television ministry. He did this in a manner that didn’t seem at all like evangelism, at least in the context of the term as many interpret it today. In a July Post-Gazette op-ed, Christine Chakoian of Pittsburgh Theological Seminary expanded upon this, upon the conflict that our country found itself in when Rev. Rogers began his “ministry”, and how the message resonates with those weary of similar patterns of conflict that we see today. Even as we hope for health, happiness, and calm as Autumn approaches, we have a midterm election to endure (and with it another silly season of political ads), as well as the continuation of many of the issues detailed above. As we enter into the fresh season of fall with its promises of new school years, new activities, cool mornings, and pumpkin spice everything, let’s do so with a fresh look at our words and how they match up with our actions. 5 – Desiderata, by Max Ehrmann. Public domain. As the next season struggles to gain a foothold on our local area, so it stands to follow that the outdoor projects yearning for warmer (and drier) conditions seem to be languishing in favor of more satisfying indoor pursuits, such as clutter removal, sorting through old paper, and watching the Stanley Cup Playoffs. This year, our house has been rooting for two teams instead of just one – the Pens and the upstart, maverick Vegas Golden Knights, featuring beloved former Pens goalie Marc-Andre Fleury. Now that our hometown team has been eliminated, it feels as if the interest of many hockey fans in Pittsburgh is turning toward the goalie we let get away. Here’s a few other things that have been going on. Since the beginning of the year, Quaker Valley has been busy gathering both community input and real estate for the proposed high school project. 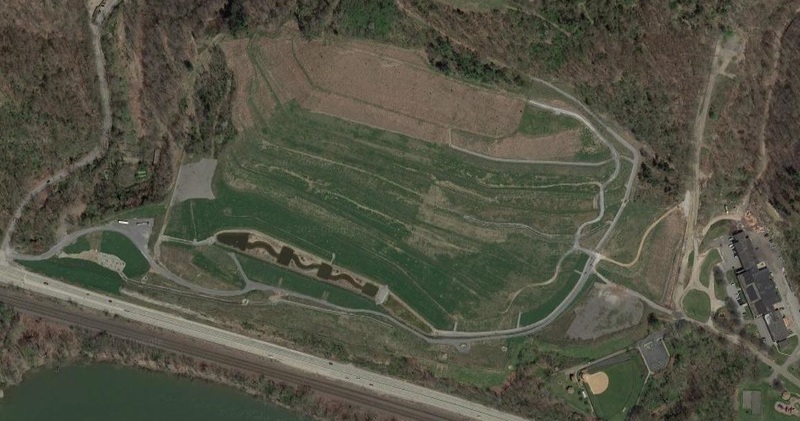 Starting with the massive land purchase in January from Three Rivers Trust (AKA Thomas Tull), the district has, to its credit, committed itself to transparency and accessibility about the future of the new facility, and the community’s role in planning it. Real estate sales information published in the Herald and county real estate data revealed that the parcels were owned by or held in trust for the five adult children of the late Robert and Maria Murrer. In 1959 Mr. Murrer, representing what was then Murrer and Phillips Inc., was the developer and sales representative for the new Quaker Heights Manor, which the Herald described in October of that year as “the first subdivision of its kind in the area…the first time that sewers and city water have been made available to the heights over-looking the Ohio River”. Today what is now Murrer and Company is also known by the name REALStats. Dan Murrer is the public face of the company, which specializes in real estate data collection and analysis. The company provides many newspapers with that weekly sales information, and is often utilized by media outlets when reporting on housing sales and pricing trends. REALStats has a great tagline – “Knowledge is Power”. It’s interesting that the two most significant land acquisitions and developments in this part of our area – those of Thomas Tull, and of Quaker Heights – are represented in the development plans for the new high school. Knowledge and transparency have extended themselves to include what appears to be the district’s stated intention to build something on the hill overlooking Leetsdale, no matter what. In a February Herald story, QV Finance Director Scott Antoline and Superintendent Heidi Ondek outlined the process of initiating the required ballot referendum, as well as the possible contingency of raising property taxes in increments permissible by law to cover the cost of a new high school, should a referendum be defeated by district voters. After spearheading these planning and information gathering efforts, Dr. Ondek announced her departure from the district in January. Whoever is eventually selected to replace her will be tasked not only with getting up to speed on district operations, but to continue what is expected to be a very active process involving an interested and well-informed community. The closure in March of the police dispatch center in Sewickley Heights Borough was something of a surprise, especially to someone for whom public safety communications has been a career activity. Full disclosure – I am employed by Allegheny County in this capacity. After reading Kimberly Palmiero’s informative story in the March 8 Herald, my memory was jogged to events of quite nearly 20 years ago, when Sewickley Borough closed their dispatch center in favor of Northwest Regional Communications, then located at the McCandless Town Hall in the North Hills. Northwest then merged into Allegheny County 9-1-1 in 2005. At the time, Allegheny County communities were being forced to choose how 9-1-1 calls from their residents would be processed, and how their resources would be dispatched and coordinated. Northwest was but one of several regional dispatch facilities that were accomplishing the consolidation of many small municipal dispatch operations countywide. This was an often contentious process, as many communities with their own dispatch centers were not interested in change. As a 9-1-1 Supervisor in Colorado, I was intrigued by this process, as the lack of any significant progress toward providing enhanced 9-1-1 services to Allegheny County residents was a factor in my leaving the area in 1995. In 1998, I was surprised to read an article in a trade publication that originally appeared in the July 2, 1998 Pittsburgh Post-Gazette. Then-Sewickley Heights manager William Rohe expressed skepticism, if not outright disdain, for the 9-1-1 system, stating his belief that the privacy of residents outweighed any of the benefits of 9-1-1 or consolidated dispatch. His assertions were met with disagreement from the county’s chief 9-1-1 official. 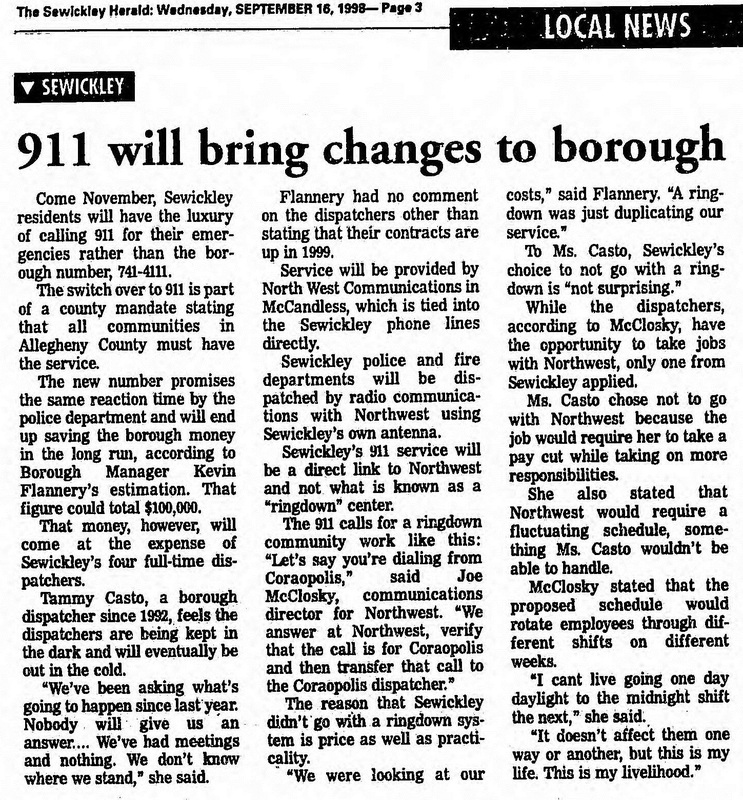 Additionally, the Herald story about Sewickley’s transition in September of that year used the word “luxury” to describe 9-1-1 service. This got me scratching my head, having made a life-changing decision to work with others in the country who had made the provision of 9-1-1 service an essential component of what many consider government’s greatest responsibility to its citizens. These events led me to comment in the Herald of October 21, 1998, in the form of a Letter to the Editor. According to the Herald coverage of this year’s transition, “a significant contributing factor was that the borough promoted (J.J.) Harrison to police chief and hired a new municipal manager, so, (Mayor John C.) Oliver said, ‘we thought it was a good time to review all operations’”. According to his LinkedIn profile, Mr. Rohe remained the borough manager up until August of last year, retiring after over 35 years of service. It’s not surprising that he may have continued to defend the status quo with same candor and vigor that he displayed in 1998. Edgeworth is now the last municipality in the Sewickley area that chooses to employ dispatchers. Several municipalities and response agencies in this part of the county continue to do the same, or receive services from another municipality. These include Coraopolis, Crescent, Findlay, Moon, North Fayette, and the Valley Ambulance Authority. Many of these small dispatch centers justify their existence through additional responsibilities over and above dispatching. In the 1990’s I worked as a part-time dispatcher in Edgeworth, Sewickley, and Avalon. In Sewickley, the dispatcher in the evening was responsible for processing the parking tickets that were paid that day. We were once told that our jobs were dependent on the revenue that those tickets generated. I never worked there again. At Avalon, dispatchers typed the officer’s reports – on a typewriter – and monitored prisoners in holding cells via CCTV cameras. The use of such camera equipment has boomed in the decades since, thanks to technology improvements, improved connectivity, and reduced cost. Cameras and other equipment installed at the intersection of Route 65 and Broad Street, coordinating traffic signals for this and nearby intersections. When new camera equipment was installed in the area of the Sewickley Bridge in recent months, I took photos of the equipment and inquired of PennDOT District 11 about their use, knowing that Sewickley Borough had been approved for a grant from the state Green Light-Go program to install a system to better coordinate the traffic signals in the area of the bridge. District 11 personnel confirmed that the cameras at the top of the light poles were indeed part of this new traffic light control system, and I can personally attest to its effectiveness in reducing traffic backups. 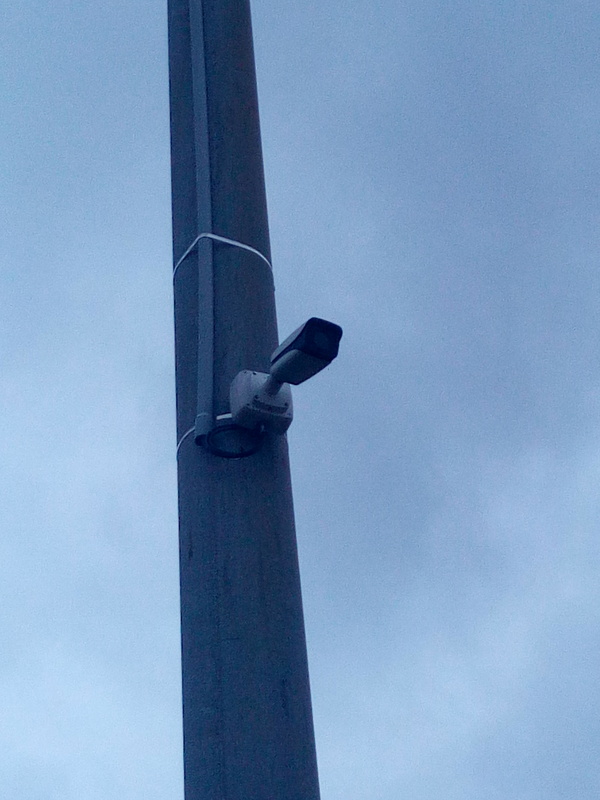 However, there were other cameras installed on these poles which were not part of the system – PennDOT personnel speculated that “some of the other devices are police devices (security cameras or plate readers) that were in place prior to the project”. Additional camera equipment mounted lower at the intersection. Now intrigued about these cameras, I reached out to Sewickley Police Chief Richard Manko. He confirmed that they are used by his department for surveillance of traffic coming across the bridge and along Route 65, and that Moon Township Police have similar cameras installed on their end of the bridge. plates of passing vehicles and store the information in a database. The chief stated that the cameras were obtained and are administered with the assistance of Allegheny County District Attorney Stephen Zappala, and referred me to his office for further comment. According to media reports in both the Post-Gazette and Tribune-Review, these are part of a growing network of cameras with ALPR systems erected at major intersections across Allegheny County, with some extension into neighboring counties. The use of ALPR technology is controversial from a civil liberties standpoint. Both the ACLU and the Electronic Frontier Foundation have issued alerts to the public, filed open records requests for data collected as part of ALPR surveillance, and in at least one state successfully litigated law enforcement agencies’ refusal to release this data under public records laws. Our concern isn’t whether or not to use ALPRs to collect the data since they can be an invaluable tool for law enforcement, but rather the right to have the information of Pennsylvanians kept private if they are doing nothing wrong. One of these co-sponsors is Rep. Rob Matzie (D-Ambridge), whose district includes Leetsdale and Leet Township. He confirmed in an email that the bill’s exact language, which allows for the use of ALPR for “legitimate law enforcement purposes”, “does NOT include passive surveillance at intersections with the sole purpose of data collection”. Our office would not have any comment on pending legislation. District Attorney Zappala has gone on record repeatedly endorsing the use of surveillance cameras and the use of license plate recognition to assist in criminal investigations and prosecutions and to create virtual checkpoints throughout Allegheny County. Should the general assembly pass any regulations and / or laws regarding the use of such technology, our office will deal with it at that time. We have no position. It’s better than the limitations that exist now, which are none, but we cannot support the bill because there are privacy concerns with the time period allowed for data retention, which is six months. That’s too long. The data that is not needed for an investigation should be deleted within days. Weeks at most. I spoke briefly with Rep. Matzie on May 5. He stated that the earliest likely time frame for consideration by the Senate will be in the fall, with the end of the current session at year’s end looming as a hard deadline. This should give some time those that are concerned about the availability of this technology and how it is utilized to learn more, and/or contact their state senator concerning the bill. As a public safety professional, I recognize the value of this technology to law enforcement. As a citizen, I am concerned with the appropriate, accountable use of the technology to achieve those ends. This bill goes as far as one can reasonably expect to establish a middle ground between public safety and the right to privacy. More recently, at least one authority board member expressed frustration over the manner that citizens took advantage of the free parking offered during last year’s holiday shopping season. Sewickley Mayor Brian Jeffe was one of the 5 board members that resigned. I reached out to him about the reasons behind it, and he replied via email. Sewickley Borough Council created the Parking Authority a few years back. The goals for the Authority were pretty simple; address the outdated coin meter (only) parking while underwriting potential long-term solutions for additional parking. As years passed there developed a disconnect between the two parties over the “vision” of parking in town. More importantly, the dialogue between the two groups oftentimes became confrontational. I am a HUGE advocate of volunteering and it made no sense to me, and the other four Authority members, to have volunteering neighbors argue over a shared concern. We opted to quietly resign to diffuse the growing tension and Council has since appointed 5 new members. We are in the process of researching all of the issues involved in the regulation and administration of the Borough’s parking assets and I think it will be a few months before we come together as a board and set a short and long-term direction. Regarding the issue of a parking structure, I think the Authority will continue to research any and all options to manage the supply of parking spaces in the Village. How you get to a financially viable supply will probably be a source of continuing debate. 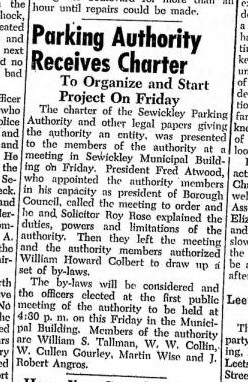 In reviewing the available history of the Parking Authority via media archives, it appears that it has been primarily a fiduciary mechanism activated by the borough whenever improvements need to be made to parking infrastructure. The reported “disconnect” between the borough and the previous board members may have had its roots in the board members deviating from whatever scope of operations that the borough may have defined for them – perhaps for having the audacity to express opinions that did not fit within the borough’s narrative regarding this important issue. The latest iteration of the authority will continue their work on Monday, May 21. Best wishes to them for taking on some challenging subject matter that may lead to some inconvenient truths – not only about the future of parking, but of the business district itself. Last month Leslie and I attended the inaugural event sponsored by Welcoming Everyone, held at St. Andrew’s Presbyterian Church. We enjoyed the simple meal, and the chance to interact with fellow area residents. Some faces were familiar – it was good to see Mayor Jeffe there, and to meet people whose only prior familiarity I had was via social media. Looking forward to their future events, and more interest from the community at large. The Herald’s new website, SewickleyHerald.com, went live this past week. This effort seems to have as its core premise a commitment to facilitating hyperlocal online reporting and event promotion. The site looks to be a promising platform for a level of community engagement not seen since Patch downsized some years ago. Have a great Spring ahead. The last few months of the year are typically busier and more hectic for me. As a result, I wind up filing away notes, electronic and otherwise, about things that happen in and around those last months. I then spend the rest of the time piecing these together into something that hopefully approaches a cohesive, informative, and entertaining narrative. That it has become more difficult to do this on a consistent basis has been a matter of increasing concern to me. Access to the appropriate tools, and having the time to use them, count among some of the impediments to this. With that in mind, here is a compendium of things local and semi-local that grabbed my interest, sometimes more than once, over the last several months. When I wrote in September about the curious situation facing Quaker Valley High School and its football team, I speculated that if the team (which was 2-0 at the time) continued their early season success, that perhaps all the uncertainty, confusion, and rumor surrounding the sudden departure of then-coach John Tortorea would be forgiven. While that level of success was indeed an understatement, there are those in the media and elsewhere who didn’t forget, in part because it’s their job not to. This year marks 40 years since I graduated from Quaker Valley High School. Many of my contemporaries from that class have no doubt followed the QV football program a lot more closely than I have in the decades since I was the PA announcer. I’m sure many of them join me in marveling at the seemingly oxymoronic moniker “QUAKER VALLEY QUAKERS – 2017 PIAA FOOTBALL CHAMPIONS”. Post-Gazette sports reporter Mike White capably followed the Quakers’ run to the title from its humble beginnings as a team without a head coach to the state championship. His coverage included a follow-up interview with Mr. Tortorea, who seemed at peace with his decision to leave, and as pleased with the team’s success as he was pained not to have been a part of it. Mr. Tortorea was also effusive in his praise for Coach Veshio, who has also reaped additional accolades ranging from the Pennsylvania sports media’s Coach of the Year award to a nomination by the Steelers for the NFL’s Don Shula High School Coach of the Year honors. Sports Illustrated melded the Quakers’ success into a picture of the importance of football to many in our region. They also got one thing right that Mr. White did not – correctly stating that the high school is located in Leetsdale, not Sewickley. Perhaps the most interesting reporting came from the Sewickley Herald. 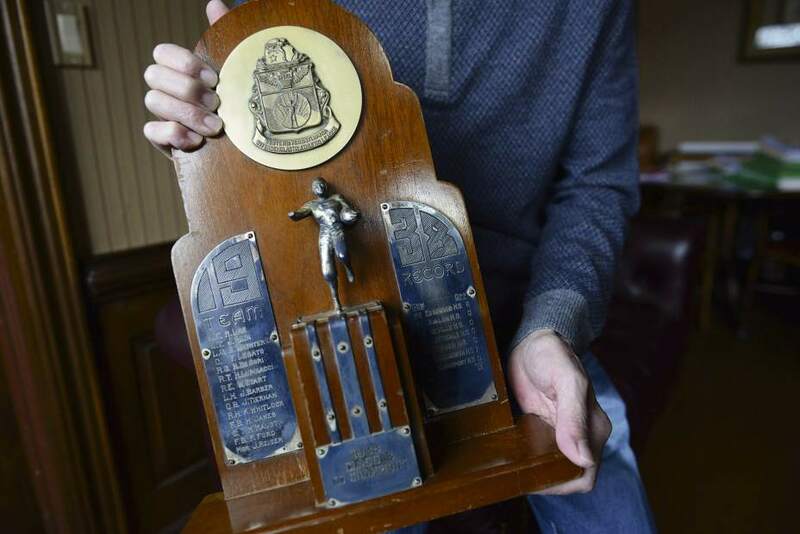 Reporter Christina Sheleheda spoke with local attorney Richard Start, whose father was a member of the 1938 Sewickley High School football team that tied with Glassport for the WPIAL title. The story included photos of the championship trophy from that season. The 1938 team also graced the front page of the November 17, 1938 Herald – my wife Leslie’s father is among those in the team photo. Some observers on social media and elsewhere took the time to opine that since the remainder of this season’s coaching staff remained intact, they perhaps deserved a greater measure of credit for the team’s success. There are differences in management styles, as well as intangibles such as Coach Veshio’s enthusiastic personality and passion for his craft, that likely served to push a well-prepared group of young men past the impediments that slowed previous campaigns, and motivating them to achieve beyond anyone’s expectations, including their own. Jerry Veshio is the kind of person that will publicly recognize the contribution of everyone that played a role in this past season’s success. This likely includes the man who built the system, and walked away from it. Coach Veshio has also made it clear that this season was his first and last. Whomever takes the helm next season will have a heck of an example to follow. Next season is not that far away, and with the loss of some key seniors the Quakers will be hard-pressed to approach their most recent success. They will hopefully fare better than the 2016 state champions, Beaver Falls, who come from the same conference as the Quakers and followed their championship campaign with a 1-8 record last season. For QV sports fans, the ride of glory potentially continues unabated, however. The boys’ basketball team has just completed their regular season undefeated, and is ranked #1 in WPIAL Class AAAA. Speaking of football and its importance to Western Pennsylvania, a key individual in the future of the sport who has local ties was back in the in the news in December. Dr. Bennet Omalu, who while working for the Allegheny County Coroner’s Office became the first to identify Chronic Traumatic Encephalopathy as a potential side effect of a life of professional football (well dramatized in the film Concussion), left the area in 2007 to become a forensic pathologist for San Joaquin County, California. Dr. Omalu and a colleague resigned in December, citing evidence they had found that implicated their boss, serving as both the elected Sheriff and Coroner, in overriding the findings of the pathologists and their autopsy reports for shooting deaths involving law enforcement. While a news search brought up several examples of regional media outlets across the country covering these events, the Pittsburgh-area media barely seemed to notice. 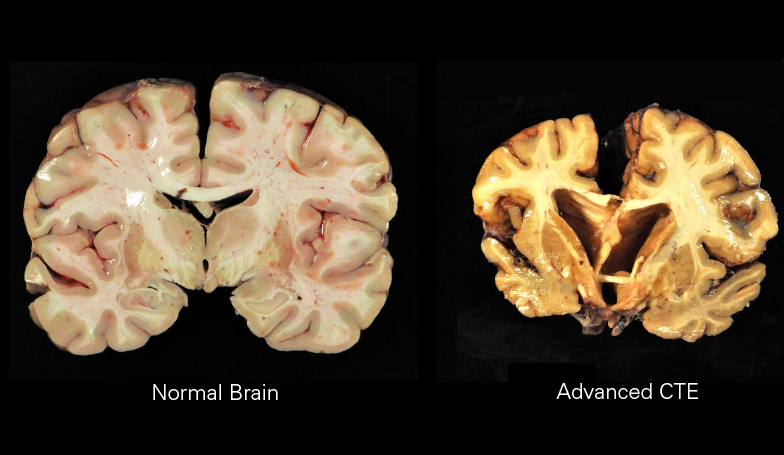 This may be continuing evidence that while Dr. Omalu and his colleagues did a great service to athletes (especially young ones) everywhere, their contributions remain somewhat unwelcome in the land of football. The title of Dr. Omalu’s most recent book, released this past August, echoes the credo that has been a hallmark of his entire career – truth doesn’t have a side. Dr. Omalu’s unflagging commitment to his profession and the inherent truths that accompany it, combined with his achievements as an immigrant, earned him an invite to attend the most recent State of the Union address as a guest of a California congressman. How appropriate to recognize the achievements of someone whose commitment to the truth has earned them equal measures of praise and scorn – an unfortunate side effect of the age of “fake news” and “alternative facts”. The dispute between Sewickley residents organized as the group Character Matters and developer Zamagias Properties effectively came to an end in December. After numerous filings of objections, objections to those objections, and intervention by the developer with additional objections (along with several delays), Allegheny County Common Pleas Judge Michael Della Vecchia held a hearing on November 21 of last year. On December 1, Judge Della Vecchia dismissed the complaint in LeCornu et al vs Sewickley Borough, citing the original objections by the borough and allowing the November 2016 decision by Sewickley council to stand. Character Matters is a group of more than 300 people who…publicly opposed this development on Centennial and Blackburn Streets. This group of residents voiced their opposition at several Sewickley Borough public meetings. Some of the issues were: height, ten-foot setbacks, inadequate parking/loading, and the mass of the buildings. All of these issues are delineated in Sewickley Borough codes and yet all of these requirements were ignored. The Zamagias group and the Sewickley Borough Council, the Mayor and the Borough Manager were present at these public council meetings and heard all of the negative remarks of the residents. Not one person spoke in favor of this development. Amazingly, the Borough Council voted in favor of building the condos. Character Matters is grateful for the residents’ support and wishes for better borough governance in the New Year. In reviewing the court documents, meeting minutes, and other material published in a previous post, I must sympathize with the plight of these residents. They expected their elected representatives and appointed administrators to employ a process that was transparent, fair, and responsive to their concerns, and they didn’t get it. Perhaps instead of being resigned to wishing for “better borough governance in the new year”, Character Matters now has hundreds of names, a good portion of which may be Sewickley residents, from which to begin an effort to leverage representative government to their advantage – if they choose to do so. The next Sewickley council election is in 2019. Interested citizens were also failed by our local media, which aside from one story (that appeared only after a complaint was lodged with their management) chose not to report on this dispute. The Herald appears to be committing significant column inches to stories related to the effort to construct a new Quaker Valley High School. Hopefully those efforts will not detract from a de facto responsibility to cover local government. That means, at a minimum, being present at the entirety of monthly council or commissioner meetings – for every municipality in our area. The November 9 meeting of Leetsdale Borough Council produced several issues worthy of additional exploration. The Herald reported on November 16 that Police Chief Daniel Raible, in his report to council, requested an additional full-time officer, lamenting the inability to retain part-time officers who may work in multiple municipalities, and perhaps lack the commitment necessary to properly serve the citizens of Leetsdale. The Herald reported this week that the borough has authorized this hiring, along with the appointment of two new members to the borough’s Civil Service Commission. The story also described at length the convoluted hiring process. Chief Raible’s remarks have been echoed by other officials in similarly sized municipalities, where a shrinking part-time labor pool has made it difficult to augment the full-time officers already in place. Other small towns in Allegheny County in the same boat appear to be moving toward a common-sense solution. Several municipalities along the Allegheny River, all part of the Fox Chapel Area School District, have started considering the consolidation of their police forces into a regional department. A recent catalyst for these discussions is a comprehensive report commissioned by the Borough of Aspinwall regarding the future of its police department. A December Tribune-Review story on the study’s findings indicated that shared services were one of its stronger recommendations. Is there anything about that statement that is not applicable to the Quaker Valley area? I don’t think so. While the other involved municipalities – Aspinwall, Blawnox, Fox Chapel, and O’Hara Township – consider their commitment to the concept in the coming months, I must wonder about municipalities in the Quaker Valley School District with similar size and demographic characteristics – Leetsdale, Leet Township, Edgeworth, Bell Acres, Sewickley Heights, and perhaps even Sewickley itself. Considering Chief Raible’s statement, what are the impediments to these communities engaging in similar study and conversation? Given the recent changes in representation in Leetsdale, it’s likely that any discussion about something that involves a perceived dilution of the parochial status quo will be dismissed out of hand. Our “new” council should be considering the budgetary advantages that are being touted elsewhere, combined with the potential increase in the local tax burden to build a new high school. Perhaps it’s time to consider substantive change in how our municipalities provide critical services, and move toward leveraging economies of scale for public safety in our area. One year ago, I reported on Leetsdale’s efforts to establish an enforcement mechanism for code violations independent of the minor judiciary. Part of that was an analysis of an ordinance involving disruptive conduct that appeared to run afoul of a 2015 court decision. To their credit, the borough recognized the deficiencies of the ordinance, and updated it into a more comprehensive document that addresses specific violations, as well as protecting those who legitimately request police assistance. Ordinance 667 was adopted at the November meeting, but apparently escaped the attention of the Herald reporter that was in attendance for at least part of those proceedings. In assuring that this ordinance is updated, the borough continues to demonstrate adequate due diligence so that regulations pertaining to property conditions are well-written and enforced fairly. Review of monthly code enforcement activity reports obtained from the borough shows a healthy portion of the code enforcement officer’s time is spent dealing with inspections of, and/or violations involving, property that is leased out by the owner. It is important that all properties, including those for rent, abide by ordinances that are crafted legally and administered fairly to preserve conditions consistent with what the community considers a safe and stable quality of life. Caution is warranted, however, to assure that property managers, landlords, and tenants are not singled out for selective enforcement, as part of an undeclared “war on renters”. Continued diligence in monitoring borough code enforcement activity, along with other key metrics such as real estate sales activity and sheriff’s sales, will remain an item of interest for me in the future. There were few if any real surprises locally in the November 7 general election. 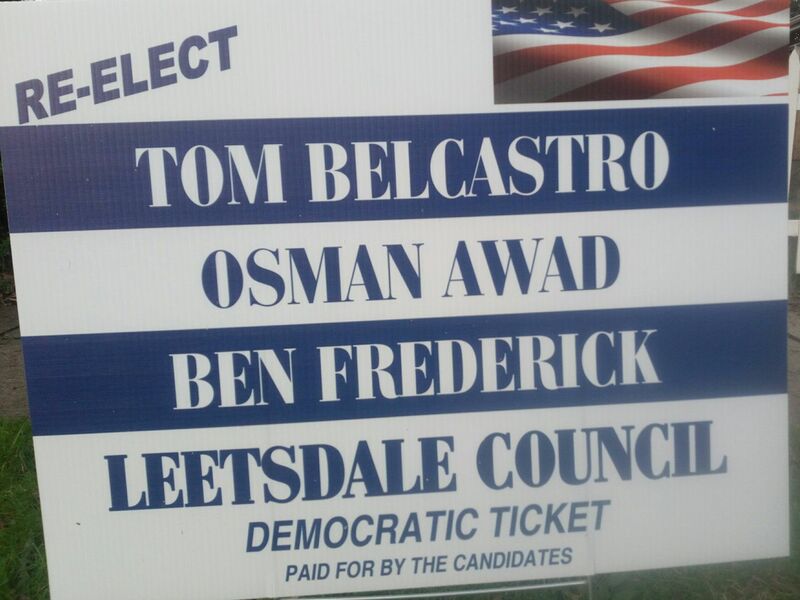 In Leetsdale, the return of incumbent Tom Belcastro and his two running mates, former councilmen Ben Frederick and Osman Awad, was successfully accomplished. The cliffhanger in this race was for the 4th and final seat, where Tom Michael, husband of now former councilor Linda Michael, defeated incumbent Wesley James by just 4 votes for the right to replace his wife. The election results also showed 12 write-in votes as part of this tally – more than enough to swing the race between Mr. Michael and Mr. James the other way. Apparently the Turd Ferguson effect is still a potent force in borough politics – at least if turnout remains low. Fate, or at least some interesting planning and execution, have since played out favorably for Mr. James. According to the November council meeting minutes, council received the resignation of council member Lauren Jones Pearce, creating a vacancy on council. Mr. James then resigned his own council seat, and was then appointed to fill the remaining 2 years of Ms. Pearce’s term. Mr. James’ old seat remained vacant until filled in January by one of the newly elected members. Apparently, this all transpired after the Herald had left the building. I verified with borough Secretary Jennifer Simek that there was no public advertisement to solicit citizen interest in filling the vacancy created by Ms. Pearce’s resignation. Wes James has distinguished himself as both a citizen and public servant. He’s a good neighbor as well. We don’t always agree, but I admire his commitment to the borough and the quality of his performance as an elected representative. While I was truly dismayed when he was not re-elected, I am somewhat concerned with the process (or lack thereof) utilized to fill this council vacancy, even if the result is a positive one. 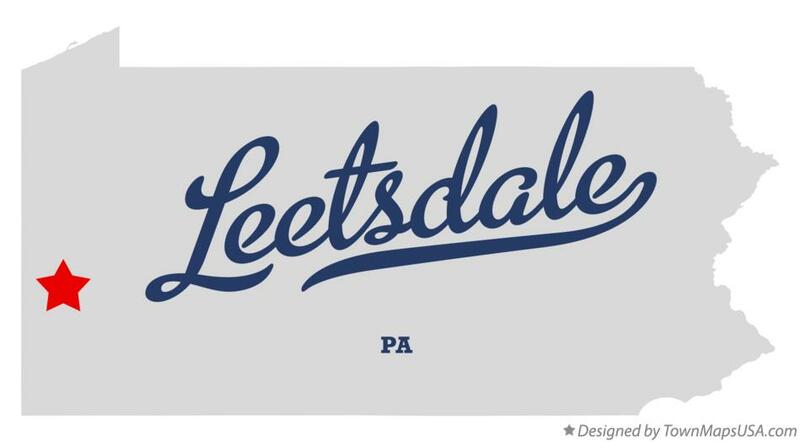 Leetsdale needs to make sure that any future vacancies for elected or appointed office are communicated to citizens in a timely fashion, with a sufficient time frame to allow for those interested to apply. I also wanted to recognize the recent passing of two former Leetsdale officials that I had the pleasure of knowing. Former council member and borough manager Paul Scimio died on November 23 of last year at age 49, leaving a wife and three children. A GoFundMe page created to assist the Scimio family still shows as active. Also, former Leetsdale Tax Collector William Hazelbach passed away on February 3. His wife Mary preceded him in death in 2016. My brother and I grew up knowing the Hazelbach family, as our fathers were friends for many years. Condolences and blessings to the families and others affected by their passing. Tomorrow is the final open house and presentation for the proposed new high school. I plan to be there, and will have more to say about the project, and other issues as they begin to take shape in the coming months. Best wishes for a safe and happy transition into spring. The black wall at the corner of Locust and Centennial in Sewickley begs for graffiti, even if only of the digital variety. UPDATED Sept. 6, 2017 to clarify comments made by Anne Clarke Ronce. The past several weeks have included some out-of-the-ordinary activities, including some time off from work along with some medical tests and procedures. To say that me and mine got some rest may be a stretch, however. This time frame has also generated its fair share of issues around the local area, both new and ongoing. Around these issues is the memory of someone who made a significant impact on many of the things that make the Sewickley area what it is today – things that we would certainly miss if they were not identified, called attention to, and celebrated. I’ve written previously about Betty G.Y. Shields, who passed away in mid-July. She was a formidable presence in the Sewickley of my teenage and young adult years. If you lived in the area back then, and have fond memories of the Bicentennial celebration in 1976, or the effort to get the Sewickley Bridge replaced, you have Mrs. Shields to thank for it. 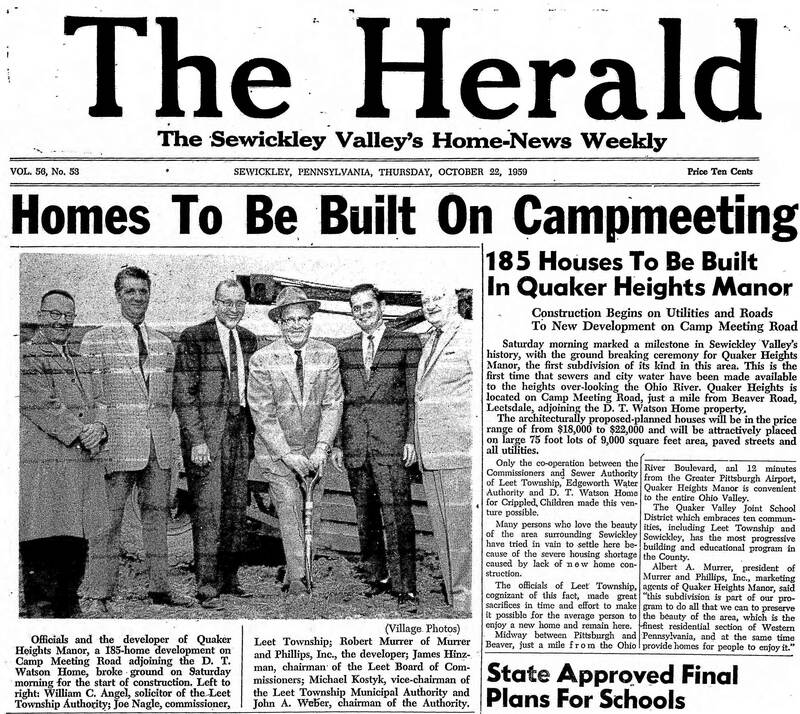 As Editor of the Sewickley Herald from 1972 to 1987, and a founding member and Executive Director of the Sewickley Valley Historical Society, “B.G.” exerted a profound influence over the way in which Sewickley and Quaker Valley area residents perceived their community back then, and as a consequence how those communities today view their past. Mrs. Shields, along with Mrs. Margaret “Judy” Lackner at Sewickley Academy, gave me a foundation of understanding in journalism, and the opportunity to see it practically applied by people who seemed to know, and enjoyed, what they were doing. As a student at the Academy in the mid-70’s, I also had the opportunity to write for the Senior School student newspaper, The Seventh Pillar. Unfortunately, Academy spokesperson Britnea Turner told me recently that the Pillar has not existed as a regular publication since at least 2014. 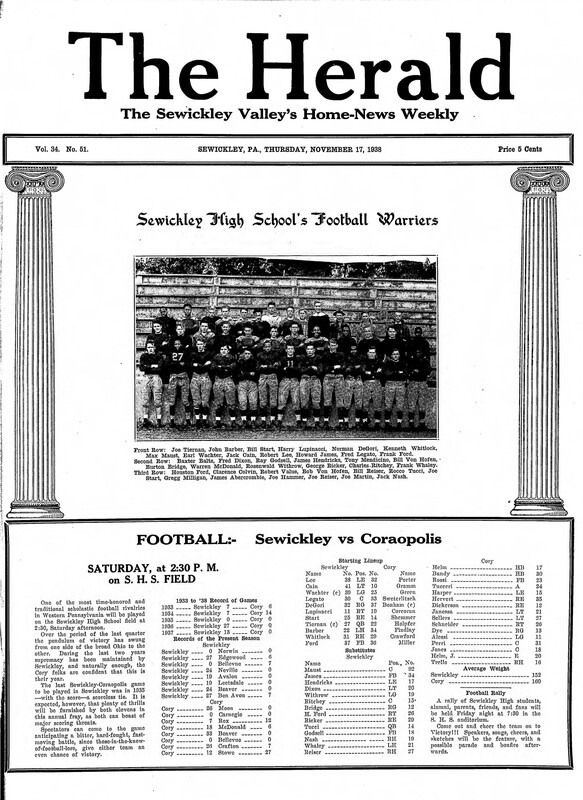 While back issues of the Pillar are relegated to personal scrapbooks and (hopefully) the school library, the handiwork of Mrs. Shields and her Herald staff at the time are readily available online via the always-fascinating digital archive, hosted by the Sewickley Public Library. If you’re interested at all in the history of our area, and want to see an example of how formidable local print media could be in those days, check out the archive for just about anytime in the 70’s and 80’s. I think you’ll get an idea of why Mrs. Shields and her legacy are revered by those who knew her. The ongoing dispute between the group “Character Matters”, Sewickley Borough, and developer Zamagias Properties, initially reported here, continues to wind its way through the Allegheny County Courts. The case is LeCornu etal vs. Sewickley Borough. After the initial complaint filed by Sewickley residents John LeCornu and Anne Clarke Ronce was partially quashed in March, these citizens wasted little time in filing an amended complaint on March 31 through their attorney at the time, Peter Georgiades. This complaint can be viewed here. Zamagias Properties, filing as Hoey’s Run, LLC, petitioned to intervene as a party defendant along with the borough, and was granted this status. Character Matters has changed attorneys. They are now represented by attorney Arthur Zamosky and others from the firm Bernstein-Burkley. Each side filed preliminary objections to the other’s initial assertions, and a hearing was held on August 16 before Judge Michael Della Vecchia. According to Character Matters representative Anne Clarke Ronce, the result of that August 16 hearing was an admonishment from Judge Della Vecchia that both sides attempt to mediate their dispute before another hearing scheduled for September 8. Ms. Ronce also stated that the judge himself offered to assist with the mediation process, and that a meeting date of September 7 has been agreed upon by both parties. Ms. Ronce also stated that the Pittsburgh History and Landmarks Foundation may also be involved in the mediation process. Contacted in late August, PHLF president Arthur Ziegler stated that his organization has offered their services. Mr. Ziegler also stated that while PHLF is not opposed to development, maintaining the “historic character of Sewickley” is a matter of interest to their organization. Away from the courthouse, Character Matters has continued their efforts at grassroots activism and community outreach, with another full-page ad in the June 15 Herald. This ad encouraged concerned citizens to attend a community meeting held July 11 at the Library, and also to write the developer at his home address in Sewickley Heights. Per Ms. Ronce, this meeting was attended by just under 30 concerned citizens, including Elizabeth Zamagias, wife of the developer, Michael Zamagias. Ms. Ronce stated she was heartened by the show of support, which included contributions to defray the group’s legal expenses, as well as offers of legal expertise and facilitating contact with other stakeholders with a potential interest in the effort. Absent from the meeting (myself included) was anyone from the Herald. Ms. Ronce stated that up to that point no one from the editorial side of the paper had been in contact with the group in any way. I made additional attempts to contact Herald Editor Bobby Cherry as the meeting date approached, but did not receive any reply. In early August I spoke with Jeff Domenick, Managing Editor for the weekly newspapers of Trib Total Media, regarding the lack of coverage of this issue by the Herald. After an e-mail as follow-up to our conversation, the August 10 Herald print edition contained a short article about the lawsuit and August 16 hearing. The story appeared on Page 14. An updated version of the story was posted online on August 15. No additional reporting about the results of the hearing as detailed above has appeared in the Herald as of August 31. I’m wondering what Mrs. Shields would have thought about the manner in which the Herald has reported on this issue. We believe that the “quorum of one” zoning decision is unfortunately legal in PA. We do not believe the conditions of the Nov 21st meeting were legal – just that they may be “normal” in some people’s minds. We believe that the ILLEGAL conditions of that meeting are the grounds for a decision overturning the results of that meeting — which is why we are persisting. Despite this, Character Matters has won a victory against what appears to be the initial legal strategy of the borough and Hoey’s Run LLC – to challenge the legitimacy of the group’s claims on the basis of technicalities, such as the length of time between the approval of the project and the filing of their complaint. The court has found that the arguments raised by Character Matters have standing. Judge Della Vecchia’s insistence that both parties attempt to mediate a settlement also serves to essentially level the playing field. For such an effort to have a chance at success, the borough and the developer must now recognize Character Matters’ arguments as legitimate concerns. 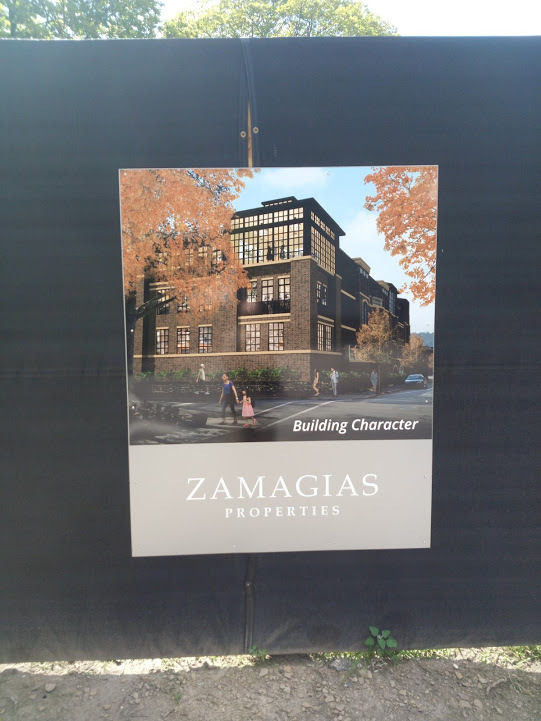 Signage placed by Zamagias Properties at the development site in Sewickley. Considering some of the on-site signage that the developer has used to advertise the project, there seems to be a visible disagreement as to what constitutes “character”. 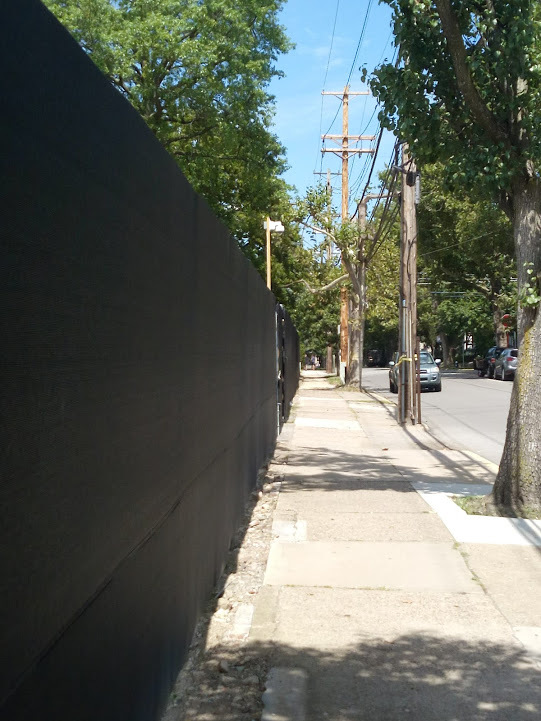 The developer has also taken some interesting steps to shield the vacant construction site from scrutiny by its neighbors, including a black sheath over solid plywood fencing, and several security cameras placed over the sidewalk around the site. One of several security cameras, this one along Centennial Avenue, keeps watch around the perimeter of the development site. Is subterfuge and security, along with legal and political legerdemain, part of how a community defines its “character”? How big of a role should effective community discourse, responsive and transparent representative government, and an active and involved local news media play in this process? These questions hang in the balance as the two parties get together later this week. Despite their lack of reporting on the condominium dispute, it’s also important to note when the Herald grabs onto an issue and brings it to the forefront. Such was the case in June, when several older residents reached out to the paper about the abrupt cancellation of a popular exercise program conducted in partnership with the Heritage Valley Health System, in space it leases at the Edgeworth Square complex for a rehabilitation center. Along with a story, the Herald also printed several letters to the Editor about the reported closure. The Herald story detailed a June 19 meeting between several of these participants and the CEO of Heritage Valley, Norm Mitry. The turnout for the meeting, estimated at around 65 people, seemed to explain Mr. Mitry’s presence – an attempt to minimize the impact of the significant outcry by a key demographic of the system’s potential customer base. As a result, the Silver Sneakers program has a reprieve at the Edgeworth Square site until at least the end of this month. The first question I asked myself when reading about this was why Heritage Valley would seek to “repurpose” the space at Edgeworth Square, given the popularity of the classes held at this location. This appeared to me to be evidenced by the large number of cars that park in the lots near that building, including the lot designated as an “overflow” lot, in which the owners of Edgeworth Square have borough approval to develop into a food service / retail venue. This was last reported to include a Chipotle restaurant. I made some calls to investigate whether it was possible that the Silver Sneakers were being moved out to make that parking lot available to build the Chipotle. Edgeworth Borough Manager John Schwend stated that the borough’s approval for the project was good for 5 years, so there wasn’t any time pressure there. I then contacted attorney W. Grant Scott, who along with Drs. Wilcox and Felix owns the Edgeworth Square building and adjacent parking lots. Mr. Scott stated that there are “no immediate plans” to develop the parking lot, and that Heritage Valley “has 3-4 years left on its lease” in their building. As of last week, however, there is heavy equipment doing some earth-moving at one of the entrances to the parking lot from Route 65. As of the date of this writing, the entire parking lot is closed off for this work. Aside from the above, it appears that not much is happening which would force Heritage Valley to move its rehab operations, and presumably Silver Sneakers, out of this conveniently accessible location. If it wasn’t the specter of flavorful burritos that had them itching to relocate, what was it? We found out in mid-July, when Heritage Valley announced its partnership with HealthSouth to construct a new 55-bed rehabilitation hospital to replace the current 44-bed facility in Leet Township, at the site of the former D.T. Watson Home for Crippled Children. There are a lot of questions regarding this new project, most notably for me how the new construction will impact the existing structure, which has historic significance as the site of some of the first human tests of the Salk Polio Vaccine in the 1950’s. Other questions involve Heritage Valley’s plans for the existing rehab facility, their leased space in Edgeworth Square (which includes the Staunton Clinic), and for the Silver Sneakers program after the end of September. Contacted in late July, HVHS Director of Marketing and Communications Suzanne Sakson stated that after reaching out internally, she was “unable to comment on the specific details of these operational decisions at this time”. This response was not unexpected, especially in the wake of the biggest story involving Heritage Valley this summer – the global hacking attacks in late June that disabled much of their information management systems. I’ll have more to report on these developments, and the history behind them, in a future post. The departure of Quaker Valley High School Dean of Students and Head Football Coach John Tortorea in early August surprised many, including, apparently, his players. What initially intrigued me the most about this seemingly abrupt departure was the nature of the media reporting on it. The first story I saw was in the Post-Gazette, in which Mr. Tortorea spoke frankly to reporter Mike White about the parental interference that became intolerable. Mr. Tortorea had nothing but praise for Athletic Director Mike Mastroianni and his staff, as well as district administration, who apparently did their best despite being unable to shield Mr. Tortorea from the parental meddling. In a passionate August 14 column, P-G sports columnist Ron Cook referenced this incident, while lamenting the loss to retirement of a generation of great football coaches in what has become a much more attention-intensive enterprise. Mr. Cook also made mention of parents that were also school board members, or who were well-connected to a board member, as a source of interference in some districts that could not be mitigated. Mr. Tortorea became much more reticent in subsequent reports to the Trib / Herald and KDKA, stating that for the good of the program he would not comment further, while being hopeful that “the parents involved will have some time of introspection”. I would think that as Dean of Students, also reported as “Dean of Student Discipline”, Mr. Tortorea may have also been under the gun from parents not only for his gridiron responsibilities, but for any disciplinary issue within the high school. It could have been worse, however – he could have worked at Woodland Hills. To the credit of Coach Jerry Veshio and his staff, the Quakers are 2-0 after roughing up both Cardinal Wuerl North Catholic and McGuffey. They have yet to begin conference play, however, which includes some heavy-duty Beaver County competition. If their success continues, perhaps all will be forgotten. Should it be? I can only speak to my own experience as a parent. My son did not play sports in school. He did play youth soccer and organized roller hockey, and I made sure I was involved as a referee or assistant in some capacity. I did not have any preconceived notions of athletic glory for him, focusing instead on being involved enough in his life that I could recognize his gifts, and encourage him to explore what gave him the most satisfaction. Today he is very active as a snowboarder, skier, rafter, and general outdoor enthusiast – things that in large measure he found for himself. I am happy enough to have given him the opportunity, and to see him leverage that into making his own life – his own happiness. I wish Mr. Tortorea the best in his career ahead. Sign for three candidates for Leetsdale Borough Council posted prior to the May 16 Primary Election. While the candidates probably didn’t intend to mislead anyone, it should be noted that while Mr. Awad and Mr. Frederick have previously served on Council, Mr. Belcastro is the only incumbent among those listed, and as such is the only one here actually seeking “re-election”. In the six weeks or so since last month’s primary election, what sticks with me as the most distressing result was how many citizens didn’t think it worth their time to participate. According to Allegheny County, only 17.3 % of the county’s registered voters bothered to involve themselves in the process. Several questions pop into my head as I look at this number. Could this be due to apathy over the process of deciding who serves as elected officials in the most fundamental form of government we have? How about who authorizes the operations of our public schools? Better yet, the judges who decide criminal and civil cases, both big and small? Could it be that the populace is still trying to recover from the angst of the last general election, and/or the fallout as President Trump continues to run roughshod over the institution of the presidency? One factor could be that Pennsylvania is one of just 11 states that hold closed primaries, where you can’t necessarily vote for the candidate you want. Regardless of the reasons, the primary, like this blog, is focused mainly on local government, something that many citizens seem to take for granted, and are often literally ignorant of. With that in mind, here’s a look at some related issues. Perhaps the most interesting set of races this year was that to determine nominees for QV school board seats, owing to the serious decisions approaching about the future of the high school building. I have not closely followed or attended any meetings concerning the planning and community input process for the new high school. Along with the district’s own attempts at communication and transparency, I have found an excellent source of information and commentary at the QV School Board Updates group on Facebook. Individuals active on that group were among those seeking a ballot position in November, and were profiled by the Sewickley Herald in one of several comprehensive stories about the election that appeared in the weeks preceding it. In two of the three board regions, that meant challenging the incumbents. No one succeeded in those challenges. It appears that Sarah Stoessel Heres from Region II, and Jonathan Kuzma and Daniela Sauro Helkowski of Region I, will retain their seats come November. Poised to join them from Region III will be newcomer Kathryn “Kati” Doebler, who is also the wife of Aleppo Township Commissioner Matt Doebler. Incumbent board member Marianne Wagner did not seek re-election. I actually hadn’t seen the population numbers broken up this way before, and I agree that it does not seem balanced. It certainly seems to make sense that it be reviewed periodically regardless of the census data, however, since this is always a good time to take stock and reevaluate. I am not the kind of person who never wants to change because “that’s how we’ve always done it”. So, if the data supports a change, then I’m open to it. I am a member of the planning committee for a new school, but I am not convinced that a brand new building is our optimal choice, nor that we, as a community, can afford it…The most responsible thing, in my view, is for the school district to continue the use and maintain the current site to serve the needs of the district. I have heard opinions that having a high school in town is a motivator for people to buy houses there, and helps house prices, and I agree with this. But should the district end up moving ahead with a new site and take all of its operations there, I would like to be very involved in making sure that the site is developed to serve the Leetsdale community, regardless of whether or not I am on the board. I support either a redistricting that respects natural topography or a system that pegs the number of representatives from a region as proportionate to the number of residents who live there. Ms. Napolitano came across as accessible, forthright, and articulate. She also appears to be focused not only on the needs of the school district, but the community at large as well. Despite her failure to win a spot on the November ballot, I look forward to her continued involvement in the process of governance and public service – my experience has shown me that you don’t always need a seat at the big table to make a difference. The QV Board, now set to continue its voyage into 2018 with its full crew of expected incumbents intact, could now move toward the board’s stated intent to pursue a new high school. They took a big step on May 30. When Thomas Tull stirred the tranquil waters of local property ownership with his 2015 purchase of the Walker estate “Muottas” and several parcels of surrounding land, it was unforeseen how the ripples from that action and subsequent moves could spread to the extent that they have today. With the QV board’s entry into a conditional purchase agreement for the Tull property, it appears that a big step has been taken to locate a new high school as close to the existing site as could have been realistically envisioned. According to a comprehensive slide presentation from the May 30 meeting, the board hired a firm to search for and identify compatible parcels of at least 40 acres within the school district boundaries. The advantages of the Tull property were spelled out – included in this was a price breakdown should the district purchase the entire 128 acres for $7.5 Million – a cost per acre of a little over $58,000. The district has 120 days to enter the property and conduct a study of its suitability for a new high school. They can cancel the agreement without apparent penalty if they determine the land won’t work out. The Herald reported this past week that engineers are well under way with this process, which apparently includes shooing away the curious. Should QV decide to continue with the purchase, they then have 210 days to obtain all necessary permits and permissions for their intended use – this means that the project will have to take shape in a manner sufficient for three local governments and other entities to approve land use and other permitting processes over the next 8-10 months. It will be interesting to monitor this process, especially if the school district also acquires “Muottas” as part of any sale. Preservation issues will likely become part of any discussion concerning the future use of the house, and the land around it. Just as with Thomas Tull’s aborted construction plans, infrastructure improvements to support a new high school may benefit some municipalities, such as new sewer infrastructure connecting the site to the Leetsdale Municipal Authority system. This will hopefully help to take a little of the sting away from a lot of land coming off the tax rolls. As the sign at the top of this post illustrates, there were a lot of familiar names in the running for Leetsdale Borough Council. Incumbent councilors Thomas Belcastro (Democratic) and Wes James (Republican) were able to secure nominations from their respective voters for one of four total seats being contested in November. The remaining ballot positions are currently held by three men already tied to council in some fashion. Democrat Osman Awad is seeking to return to council after losing as an incumbent in 2013. Democrat Ben Frederick is also a former councilor seeking to be elected again. Tom Michael has yet to serve on council, but his wife Linda Michael is a current council member who is not running for re-election. Incumbent Democrat Michael Nobers was not successful, but may not be completely out of the running, depending upon numerous write-in votes by Republican voters (which actually outnumbered votes for Wes James) that could give Mr. Nobers a position on the GOP side of the ballot. There is recent historical precedent for this activity impacting elections in the borough, owing to poor turnout and ill-advised attempts at humor. In trying to gain an understanding of why our elected officials seem to originate from the same general group of citizens (including those who lose elections and return to run again), I must look at my own personal situation as much as other factors. I work shifts, and can’t make many evening meetings. My family obligations are significant. Thus, I can’t fault most of us who shy away from seeking elective office. The seeming lack of fresh faces stepping forward to help govern Leetsdale may be as much a sign that things are going well as of anything else. The borough, despite the absence of a day-to-day authoritative presence in the form of a full-time manager, seems to be operating in an efficient, transparent, and accountable manner. This isn’t to say that there aren’t any problems, but they aren’t significant enough to declare that the ship of state is in distress. Let’s hope that the return of some of the old guard to the fold doesn’t change that. When our local Magisterial District Judge, Bob Ford, started his re-election campaign in earnest very early this year, I was mildly surprised. Judge Ford was unopposed for his election in 2011 – was there someone in the community mounting an unexpected challenge? The answer was yes…but not just in our area. District Judge races were hotly contested in many areas across the county. Reporting by PublicSource and other media outlets highlighted many of the races that pitted lawyers against non-lawyers for this locally-based position in our justice system, for which a law degree is not a pre-requisite. In all but two of the races, non-lawyer incumbents (including Judge Ford) or newcomers won both nominations, and are likely assured of their seat come November. Only one lawyer bested his non-lawyer opponent in the Sto-Rox area, and a non-lawyer Democrat will face a Republican lawyer in the fall – in heavily Democratic Wilkinsburg and Edgewood. Judge Ford’s opponent, Lori Capone-Cirilano, also made being a lawyer an issue in her campaign. Lawyers also challenged two other non-lawyer incumbent justices – William Wagner in McCandless and Jeffrey Herbst in Monroeville. I’m wondering if there was a coordinated effort at some level to target these judges based simply on their lack of a law degree, while discounting critical intangibles such as practical experience, time in the community, and relationships with key stakeholder groups. If so, those coordinating these challenges badly miscalculated the value of a long-standing, positive relationship with the community being served. Last month a task force that included prominent educators, municipal and county officials, and consultants got together to promote the findings of a report touting the potential benefits of disincorporation for many of Allegheny County’s small and/or financially distressed municipalities. Post-Gazette columnist Brian O’Neill shone some light on a Quaker Valley municipality while writing about this whole mess. His initial column featured an elected official in Glenfield Borough, population 205, and her motivation to run for council – to get a better playground for borough children. Mr. O’Neill also stirred up a little tempest by continuing to feature Glenfield in his writing, this time on May 27 with a column about Glenfield’s Mayor, Michael Cherock, and his unique assessment of Glenfield’s government as akin to a certain fraternal organization, perhaps without the secret handshakes. Mr. Cherock owns a small, successful Pittsburgh architecture firm, and is apparently relocating his family to Sewickley. He seemed to be using the column to announce his intent to resign as Mayor. This story was followed by a June 1 Letter to the Editor, in which Glenfield Council President David Orbison, himself a psychologist by trade, took Mayor Cherock to task for the manner in which he announced his future plans. Mr. Orbison termed Glenfield’s current operating posture “nimble and productive”, which may be true. 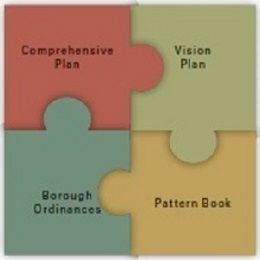 However, that doesn’t prevent the borough from being anachronistic and duplicative in the age of modern governance. It’s been the contention of this corner since I returned to the area that the continued existence of 130 separate municipal entities is a grossly inefficient waste of taxpayer dollars. Unfortunately, the process advocated by this “task force” places all its eggs in the basket of county government, through the creation of unincorporated areas. This focus on disincorporation is essentially useless because it ignores the obvious compromise between this “solution” and the status quo – that is the common-sense consolidation of boroughs and townships, and/or the increased use of shared services organized through groups such as the Quaker Valley COG. This would still allow for the local control of services, while allowing the leverage of economies of scale to optimize efficient service delivery to the taxpayer. Perhaps it’s time for Glenfield, Haysville, and others in our area to consider their realistic future as independent municipalities. While researching Glenfield’s elected officials, I was kind of surprised that there was another psychologist politician in our area besides my congressman, Tim Murphy. Tim and his neighbor in Republican politics in our area, Keith Rothfus, have drawn criticism and protests over their alleged lack of public accessibility and responsiveness to constituents since Donald Trump assumed the Presidency. While several Democrats in the 18th District are mulling a run against Murphy in 2018, none have announced their intent as yet. In contrast, Sewickley resident Rothfus already has three Democrats lined up for the chance to take him on next year. Among these three is area native and Sewickley Heights resident Beth Tarasi. Beth Tarasi and I both graduated from QV as part of the Class of 1978. While we didn’t really travel in the same circles, I remember her as an accomplished athlete and student. From high school she continued to move forward as a student athlete at Pitt, then through Duquesne’s law school, into motherhood, and becoming a successful attorney alongside her father. Ms. Tarasi, along with fellow Democrats Aaron Anthony of Shaler and Tom Prigg of McCandless, possess varied and diverse backgrounds (Ms. Tarasi is the only lawyer of the three) that will hopefully produce both a spirited primary campaign and a candidate capable and prepared to unseat Mr. Rothfus a year from this coming November. With the gerrymandering of Pennsylvania congressional districts that is now undergoing a court challenge, this will not be an easy task. Whomever is the Democratic nominee needs to carry forward a message that resonates with voters not only in northern Allegheny County, but from Somerset and Cambria Counties to Beaver County as well. As for Tim Murphy, the Leetsdale 4th of July Committee confirmed that he was invited to walk in this year’s parade. Whether or not he shows up, well…. A ‘small cell” wireless phone transmitter site, disguised as a utility pole, at Broad and Beaver Streets in Sewickley. These sites are designed to provide coverage through the upcoming transition to 5G wireless networks. Several of these sites can be seen in and around the Sewickley business district. At the end of March, I posted the first in a short series about changes both in progress and on the horizon in Sewickley Borough’s business district. Below are some additional things that I’ve noticed. 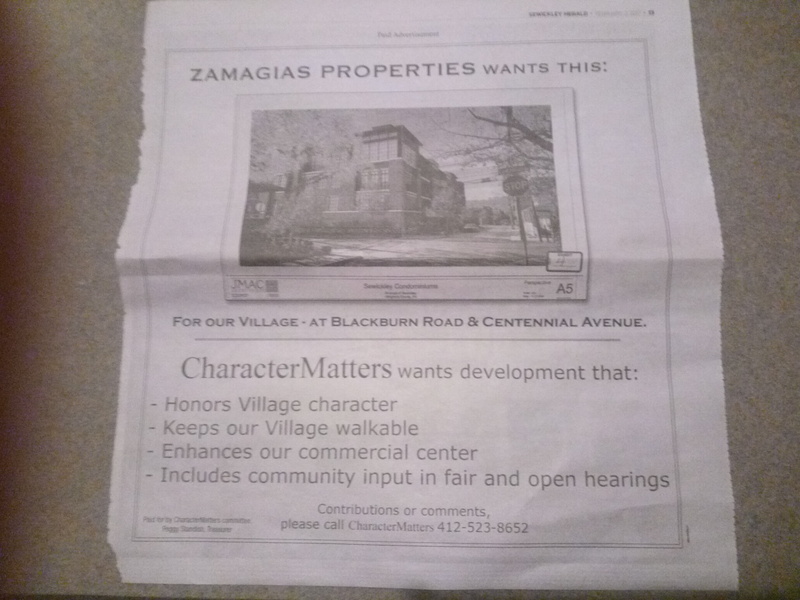 First, an update about Character Matters and the proposed Zamagias development. On March 31, Sewickley residents John LeCornu and Anne Clarke Ronce filed a complaint in Common Pleas Court¹ challenging the results of the Sewickley Borough Council hearing of November 21, 2016. As I wrote previously, their challenge is based on alleged violations of the Pennsylvania Sunshine Act. While it’s still unknown if the Sewickley Herald will devote any resources to report on the dispute, I will provide updates as I can. …and its predecessor at Beaver and Locust, taken 40 years ago. Leslie and I attended a screening of Fences during the opening weekend for Sewickley’s new movie house, the long-anticipated Tull Family Theater. The building has a very clean, corporate feel to it – this was offset somewhat by the warm reception we received from an eager group of staff members, most of them in their late teens or early twenties. The picture and sound quality were excellent, the seats ample and comfortable. According to their website and additional reporting in the March 9 Herald, the theater has a programming schedule that is robust and varied, showing recent Oscar winners and nominees as well as classic films and specialty screenings of films showcasing the arts. More recent advertising touts some first-run big studio films coming up, along with smaller independent productions. On April 10, I met with Executive Director Carolina Pais-Barreto Beyers and Communications and Education Director Karen Ferrick-Roman. They make up two of the theater’s three full-time employees. Ms. Beyers emphasized that their core goal as a community asset is proficiency in cinema, and that the primary purpose of their diverse programming is an attempt to be a cultural center as well as a movie house – representative of the desires of their target audience, with the obvious metric – attendance – defining the direction they will take. Ms. Beyers and Ms. Roman cited an extraordinary response to the film Hermitage Revealed as an example of some of the ways they have been surprised at the success of some of their early film selections. The Sewickley community is apparently so enamored of their new theater and its programming that the Herald was sufficiently persuaded to name the Tull Theater its 2016 Citizen of the Year. Perhaps the awardee should be more properly identified as the founding hearts and minds of the Village Theater Company, without whose literal and figurative groundbreaking work over several years there would not be a movie theater in Sewickley today. Last week’s Herald account gives credit where it is due. The theater is actively seeking other groups or companies to help to sponsor similar outreach to “underserved children and senior adults”. The same day I was there, the theater was setting up for an afternoon sensory friendly screening of Beauty and the Beast, in conjunction with Laughlin Children’s Center. I asked Ms. Beyers to comment on an informal survey I had conducted among independent, non-profit theaters in the Pittsburgh area, which showed that the Tull Theater is the most expensive in terms of full price adult admission. The $11.00 ticket cost also exceeds most multiplex theaters for a 2-D movie, and there is no “matinee” pricing for afternoon screenings. Stating that “we absolutely need” the price charged for a full-price ticket, Ms. Beyers cited the varied programming, community outreach efforts, and new facility and equipment as contributing factors to the value a customer receives for their ticket price. Ms. Beyers has a point. While other independent cinemas in our area provide unique and specialty programming experiences, the scope of the Tull’s offerings has been impressive for a group still trying to find what clicks with its customer base. That exploration will continue with leveraging the theater’s Esmark and Bouchard Family Community Room, named for another large donor. The theater plans to begin using that space for small-scale live performances, as well as rentals for community events. The Post-Gazette reported recently on efforts across the region to restore historic theater buildings as part of the revitalization of small town business districts. The multi-year efforts by those in Sewickley to bring movies back to “The Village” seems prescient to those going on now in communities like Ligonier and Latrobe. There is also an ongoing effort to restore the former Denis Theatre in Mt. Lebanon. With its first-rate facility and professional management team, the Tull Theater has the potential to create a truly memorable entertainment experience for “Village” visitors and regulars alike. I’m looking forward to both continued excellence and more creative innovations in programming, but some moderation on price as well. It’s apparent that the support of the community to fill their seats will be a key to that, and much more. Now don’t you wait, or hesitate. Let’s move before they raise the parking rate. The twice-resurrected Sewickley Parking Authority has used its latest lease on life to make some significant changes in how they manage their revenue stream, as well as planning for future improvements. First created in 1952, killed off, then brought back from the dead in the 1980s and again in 2015, the Parking Authority appears to exist solely as a mechanism for facilitating parking operations and capital improvements, while insulating these activities from the borough’s own fiscal operations. After some initial hiccups, the transition from parking meters to pay stations appears to have been completed. With it comes a doubling of the parking rates for spaces in the business district, along with a doubling of parking fines. I’m familiar with the pay station concept as applied by the Pittsburgh Parking Authority. My first experience with Sewickley’s pay stations was a little more problematic than my prior uses – the buttons don’t seem to be as sensitive, and the device itself doesn’t feel as though it can survive the kind of abuse – human and otherwise – that can be meted out over time. We’ll see. The authority is also feeling pressure from the business community regarding insufficient parking in the business district, and the need to move forward with a planned garage in the location of the existing municipal lot on Green Street. Business representatives that spoke to the Authority board at its February meeting cited the opening of the Tull Theater as a contributing factor to the Village’s parking woes. The Herald report included cost estimates, depending on the design approved, of anywhere from 6.5 to 7 million dollars for a garage that would add roughly 200 spaces, while not dominating the Village skyline. Sewickley Mayor Brian Jeffe was quoted by the Herald as stating “We do not want this castle in the middle of town”. I wonder what the Mayor thinks about the “castle” that’s been approved to go up just a block or two away. Should such a garage be built, what may the additional impact be on parking fees borough-wide? Could we see a return of fees for Saturday parking? Of greater concern is exactly how much business Sewickley is attracting to justify the increased fees and garage construction. I can understand the concept of Sewickley as a specialty shopping and dining destination, and some of the special events during the year certainly attract some crowds. How much of that foot traffic translates to real business income, and/or an experience that people are willing to pay a premium for, and not just for parking? I don’t know the answers, but for those who rely on the health of Sewickley’s business district for their livelihood, I certainly hope that these changes are economically sustainable in the long haul. Groups such as Explore Sewickley are attempting to gauge community sentiment, and encourage involvement in the Parking Authority and its operations. In the meantime, those of us who choose to visit Sewickley during the business day may have additional factors to consider before deciding if the end justifies the means. Bordering on the Bizarre – Whose Left is it Anyway? Over one year ago I reported about proposed changes in left turns from southbound Ohio River Boulevard onto Graham Street and Boundary Street in Sewickley, and their potential impact on motorists trying to reach places not easily accessible by other routes, such as the Critmore Medical Building. I also updated that reporting in a May 2016 post. In mid-February, I got to witness firsthand some of the rush hour craziness of Route 65 in this area. One the way home from an overnight shift at about 7:45 AM, a car trying to make a left turn into Osborne Plaza from northbound 65 triggered a chain reaction rear-end crash that pinned one driver in her vehicle and sent a box truck into the hillside. I heard the crash behind me, saw the box truck turn sideways, saw the power lines to my right shudder from the impact of the truck into a pole. This was one of my few recent exposures to true rush hour traffic along this stretch of roadway. It was unnerving to see so many cars jockeying for lane position, or trying to make left turns across oncoming traffic. The problems associated with traffic volume that outstrips the design and load capabilities of the roadway involved are a common problem in our area, and Route 65 is one of the more egregious examples, especially in areas such as this one that are too narrow to accommodate a center turn lane. In response to a request from Sewickley Police, PennDOT has evaluated this area, and has been making recommendations to police and other officials to restrict left turns from southbound Route 65 onto and from Graham Street and Boundary Street, as well as make Graham Street one way from Ackley Terrace to Route 65, thus eliminating turns from the boulevard altogether. Route 65 at Boundary Street, looking south. Since last year’s post, the borough has received lots of feedback from citizens and other stakeholders, in the form of comments at council meetings and personal contact with the Mayor and other officials. In March of this year, council debated the proposed restrictions, and arrived at a compromise draft ordinance that would only establish left turn restrictions during rush hour traffic periods. At their meeting of April 11, council approved this compromise as Ordinance 1351, which went into effect immediately. Borough Manager Kevin Flannery estimated last week that “the signage will be in place within the next 2-3 weeks”. I believe that the compromise is a good move on council’s part, so long as it can be enforced in an effective manner, while not creating additional confusion or hazards for the traveling public. It would have been nice if the Herald had followed up on their March 20 story by reporting the eventual outcome, but as of their April 27 edition no story has been published, either online or in print. As I detailed in April 2016, there are some things left unresolved – the no left turn restriction at Boundary Street may impair the ability of patients and employees at the Critmore Medical Building from being able to legally access the facility from Route 65 during rush hour. This has a lot to do with the intersection of McKown Lane and Route 65, where left turns are always prohibited. Without additional directional signage, this could leave unfamiliar travelers scrambling to access the facility, and often chancing an illegal left turn out of frustration and/or a lack of knowledge of the area. This intersection, like Critmore itself, lies within Glen Osborne Borough, and any change to the restriction on McKown would have to come from Glen Osborne council. Review of council minutes for February show that Sewickley Mayor Brian Jeffe and Police Chief Richard Manko addressed council regarding not only left turn restrictions, but the need for increased traffic enforcement along the Route 65 corridor beyond the Glen Osborne boundary. There is some awful recent history involving this stretch of the roadway as well. Council members stated in March that they would monitor Sewickley’s actions pertaining to left turn restrictions, and make recommendations accordingly. Let’s hope so. Chief Manko went as far as to opine that his borough should be contracted to provide police service to Haysville and Glenfield, which are currently the only Allegheny County municipalities receiving protection from the Pennsylvania State Police. While that topic is certainly worth exploring further – and I will – I would opine that police protection in these tiny boroughs is much more than just Route 65, and in the case of Glenfield that role might be better fulfilled by the Ohio Township Police, who currently protect every other municipality surrounding it, excepting Haysville. 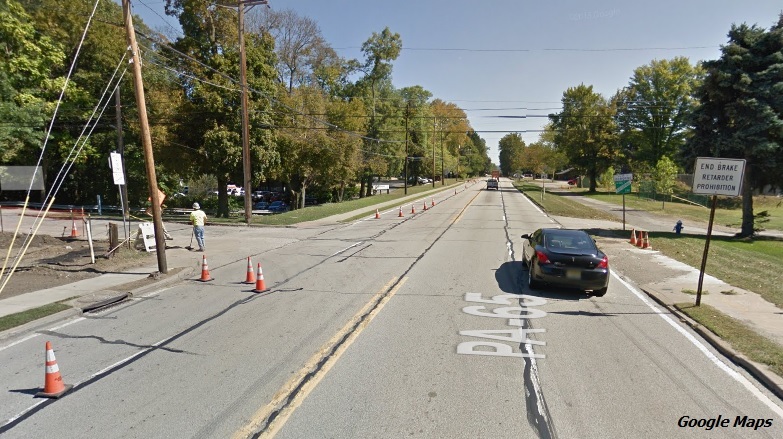 It also could be argued by Glenfield residents that their biggest traffic issue may not be Route 65, but Kilbuck Street leading to the on-ramp for Interstate 79 north – a residential neighborhood with a 25 MPH speed limit that is largely ignored. Have a safe and healthy springtime ahead – it’s election season! Change in Sewickley: Character Matters, But to Whom? My wife and I were both born in Sewickley Valley Hospital during the month of March. While we have both also lived in other regions of the country for extended periods of time, the bulk of our formative years were spent either in Sewickley, or very close to it. Just as we existed in the same geographic area for many years without being aware of each other, our memories of the Sewickley area hold different significance for each of us. 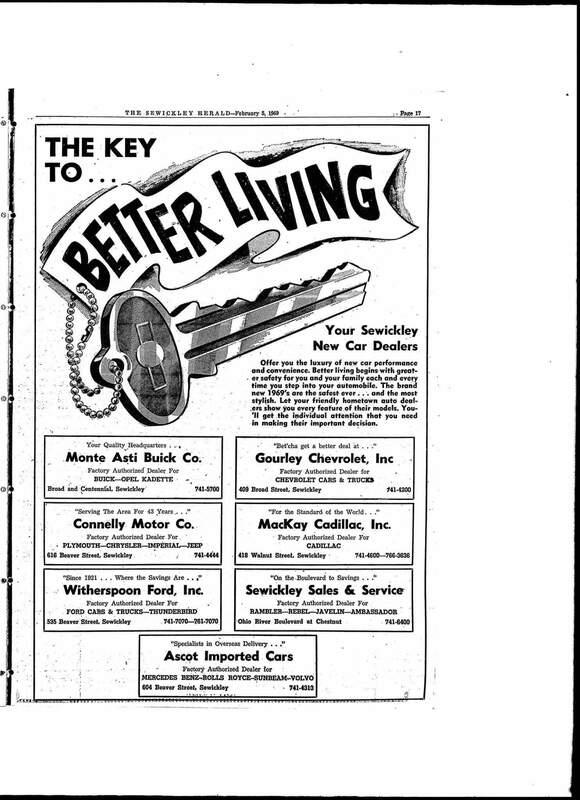 I am acutely aware of places that aren’t there anymore – 6 of the 7 car dealerships that existed in the Sewickley of my youth. The old house on Walnut that my mother painted pink and opened as a shoe store in 1974. Carroll’s Music Shop and its owner, the late George Habers. The Sewickley Theater and Bill Wheat. Across from the the theater was Isaly’s, where in the the summer of 1976 I feverishly scooped ice cream for patrons lined up three deep after All the President’s Men let out. 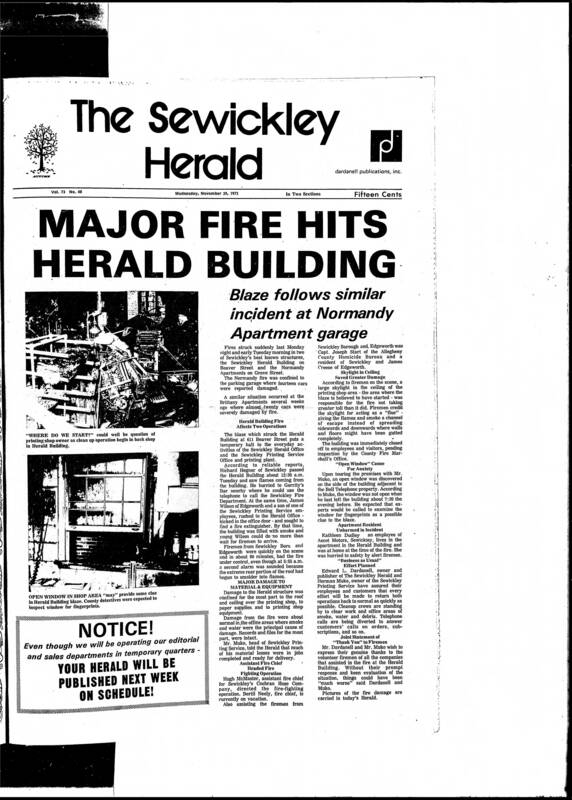 The Sewickley Herald and all of its locations around town, from the 600 block of Beaver to the Flatiron Building at Beaver and Division, to Hegner Way. 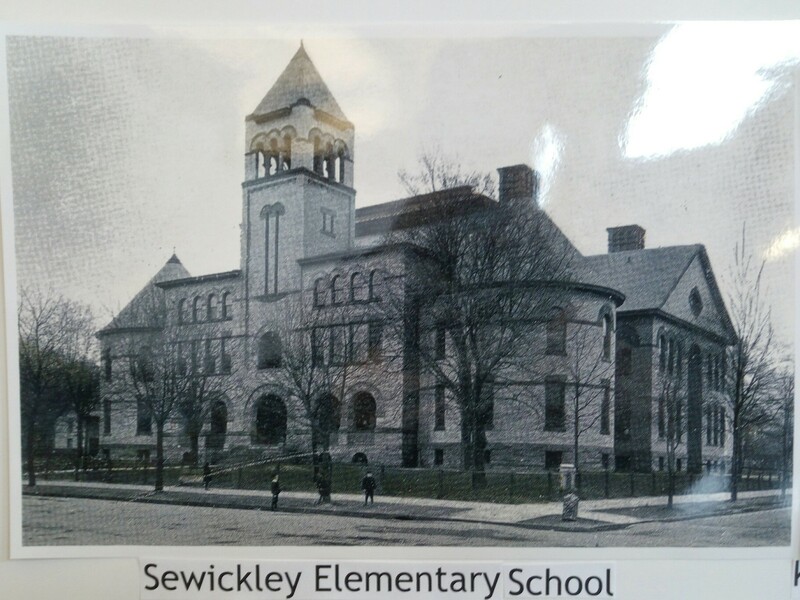 Leslie told me that she misses the majestic Sewickley Elementary School, and remembers fondly the Sewickley Pharmacy at Beaver and Walnut, and in particular its proprietor, the late Joseph Dzurec. She also relayed that by age 5 she was well aware of which businesses she was welcome in, and which ones she was not. Leslie and I are both in agreement that our favorite place in Sewickley is an enduring edifice that remains a vital, dynamic force in shaping the character of the local community, especially its children – the Sewickley Public Library. The borough’s signature “Village” business district has been heavy in the throes of change for several years, trying to reinvent itself as an area with unique and trendy retail and restaurant “experiences”, bolstered by unique events – all while trying to maintain a sense of the traditional that appears to be valued by those who call the borough home, as well as by many who visit. This convergence of ideals and goals is presenting new challenges and opportunities, and is making for some lively interactions, as well as some things that make you go “hmmmm”. This is the first of a short series taking a look at a few of them. Character Matters, But To Whom? Full-page ads placed in the Herald editions of February 2 and February 9 signaled the apparent beginning of an effort to garner grassroots opposition to Sewickley Borough’s approval of a condominium development, on land that consisted of vacant houses along Blackburn Avenue and office space along Centennial Avenue between Blackburn and Locust Place – an area colloquially known as “Doctor’s Row”. History buffs may remember that the Herald established temporary quarters in this complex after fire severely damaged their building in November 1972. According to the October 2016 meeting minutes of the Sewickley Planning Commission, as well as the November 21, 2016 minutes of Sewickley Council, numerous adjacent property owners and borough residents expressed concerns regarding this development, including the height of the buildings, which appear from artist’s renderings to dwarf any other commercial or multi-family structure in the immediate area. Other concerns included parking, light blockage, and a “governor’s drive” for a loading zone. Both bodies approved the development in the face of this opposition. Earlier this month the nonprofit, unincorporated group “Character Matters”, which had purchased the Herald ads in February, filed a petition to intervene¹, or join, the appeal. President Peggy Standish and Secretary/Treasurer Anne Clarke Ronce are listed on the petition, which states that their membership includes “118 individuals who have an interest in the matter of the construction” of the condominium complex. Character Matters and Mr. LeCornu are represented by Pittsburgh attorney Peter Georgiades. First contacted on March 16, Mr. LeCornu stated that the initial basis for the appeal is the nature in which council conducted the November 21 meeting, which Mr. LeCornu termed a “mob scene”, and that several speakers were interrupted by an attorney for the developer, Zamagias Properties. Mr. LeCornu stated that the appeal seeks to invalidate the land use hearing and its findings due to violations of the Pennsylvania Sunshine Act, related to the failure of the borough to provide adequate space and time for public comment, and to assure that decorum was maintained. If that was successful, they then intended to pursue the development application on its merits, or the lack thereof. During a hearing on March 20 before Judge Joseph James, attorneys for the developers were granted a motion to quash¹ the land use portion of the appeal. Mr. LeCornu stated on March 21 that he and Character Matters can only challenge the results of the meeting based on the alleged violations of the Sunshine Act, and that the penalties against the borough for such a violation may not invalidate any decision reached during that meeting. Mr. LeCornu lamented the “adversarial atmosphere” that accompanies many of these public meetings, and wondered out loud why many local elected officials seem unapproachable and aloof. He added that his group lacks the financial resources to pursue any further appeals beyond that involving the Sunshine Act. Multiple attempts to contact Anne Clarke Ronce were unsuccessful. Character Matters does not appear to have a website, nor a presence on any social media platform. Alongside any alleged misfeasance on the part of Sewickley Borough and its appointed and/or elected officials is the lack of media coverage of these events as they happened, and continue to occur. The Herald did report on the proposed development in July 2016, and again in early October. The latter story included concerns regarding a seemingly questionable, one-person Zoning Hearing Board ruling, along with some of the same issues expressed during subsequent government meetings. I can find no other Herald reporting on those Planning Commission and Council hearings, or the vocal opposition related to both the project and the approvals granted. Mr. LeCornu stated that as of March 21, he had not been contacted by any Herald reporter regarding the appeal. This issue represents to me one of the most visibly contentious involving local government in recent memory – an issue in which the Herald, for as yet unexplained reasons, has been essentially mute. We know local news is important. In the last several weeks — and especially within the last few days — I’ve heard from many readers who have been concerned the Herald was closing. They all indicated how important the Herald is to them for knowing what’s going on in our community — from news to events to sports, etc. No other publication or service regularly reaches as many people in the Sewickley Valley as the Sewickley Herald. While that last statement may be true, multiple attempts to reach Mr. Cherry in the last week via e-mail and voicemail messages were unsuccessful. What good is such a pervasive local publication if it fails to consistently report on those issues that so many citizens seem to be concerned about? This isn’t the first time in recent years that the Herald has appeared to drop the ball with regard to controversial decisions made by municipal governments. There needs to be a consistent commitment toward assuring that the Herald is represented at as many official meetings of municipal government as possible. On the positive side, it does appear that more emphasis is being placed on doing exactly that. The March 16 Herald included reporting on a decision by Sewickley Council that smacks of the questionable if not incredulous, given the controversial issues and significant public dissent in recent months. Reporter Matthew Peaslee did a good job of making comparisons to other local governmental bodies and their meeting schedules, as well as getting input from a well-known media law advocacy group. If Sewickley chooses to respond to heightened levels of public involvement by reducing the number of opportunities for the public to learn about and participate in their government, what message does that send? Sewickley Council, to its credit, seems to do a competent job of trying to preserve much of the historic character of the borough. Sometimes those efforts seem to defy explanation, especially with regard to recent larger projects. The borough approved the Elmhurst development over neighborhood opposition, and fought one resident in court for several years. I believe that the character of the borough does matter to them, but character doesn’t pay the bills. When a project that promises a healthy property tax potential comes along, many things must be weighed in the balance of maintaining the kind of community Sewickley desires to be. The question remains if their efforts will be found wanting in the eyes of citizens. “Where else would I find out what’s going on in Sewickley?” By the very nature of the technology available to distribute information via the Internet, the answer is literally lots of places – one reason that print media is finding it hard to stay relevant. Most local municipalities deserve credit for maintaining some form of robust web presence – even tiny Glenfield Borough offers a comprehensive website that is regularly updated. Several are included in the sidebar of this blog. Instead of buying full-page ads in the Herald, Character Matters could have retained a marketing consultant, who could have built a website and e-mail domain, created social media pages, and developed an e-mail newsletter. Smaller, less expensive print ads referring interested readers to the website and social media could also have been added to the mix, to cover all bases. This combination has the potential to reach more citizens than just print advertising, and also affords the ability to provide frequent updates, solicit participation and/or funding support, and most importantly retain greater control of the message being delivered. 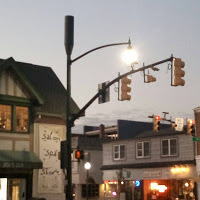 Even something as simple as a petition on sites such as change.org can be very effective, as evidenced when resident Matt Chapman created one regarding the Sewickley fire horn in 2014. Just as ignorance of the law is no excuse, neither is a lack of knowledge regarding the manner in which local government conducts business. While Sewickley officials may have engaged in questionable conduct in certain aspects of this land use approval, concerned citizens have the ability to learn more about those operations through online resources such as the Civics and You PA site, and the Sunshine Act information page. As it stands now, any barometer for community outrage may very well be related to the eventual (if not inevitable) construction of the complex. Should Sewickley residents begin to react negatively as the condo buildings begin to rise, I’m wondering if those feelings will translate themselves into a grassroots activism that can be harnessed into political action – much as we are seeing around the country in response to the election of Donald Trump. Should such feelings indeed materialize, it may be advantageous for groups such as Character Matters to focus their efforts on effective organization, as well as candidate recruitment for the next municipal election cycle. It will be interesting to see how citizens, their local government, and our local journalists react to those opportunities in the months ahead. The first months of the new year have brought with them new resolve around our house – a need to renew old efforts, blaze new trails, reset and try to re-energize relationships and living arrangements that too often can grow stale and cluttered. It’s not been easy, and it doesn’t seem to be shaping up as an ‘easy’ year, especially when considering the craziness being displayed by the new administration in Washington. As the focus here is on local activities, we’ll continue with that, with the knowledge that great achievements start with small moves. Since this time last year, I’ve been following the dispute between an elderly Edgeworth resident and the borough’s Shade Tree Commission over her right to remove three pin oak trees from in front of her residence on Oliver Road. After repeated denials by that commission, Dolores Bassett took her fight to Common Pleas Court, which found in her favor a little over a year ago. Edgeworth Borough then appealed that decision to Commonwealth Court, which heard arguments last November. On January 24, the court issued a decision upholding the lower court’s finding in favor of Mrs. Bassett’s right to remove the trees. The opinion issued by Commonwealth Court is an enlightening read for anyone interested in the historical perspectives surrounding land use, local ordinances governing it, and the intricacies of the law as they pertain to language and precedent. Among other findings, the court ruled that the applicable section of the borough code pertaining to the removal of trees “applies only by its plain text to those situations where the (Shade Tree) Commission may ‘require the removal of any afflicted tree in the public right-of-way’”. Mrs. Bassett wanted to remove the trees, due in part to their continued compromise of the sidewalk that the borough required her to maintain in a safe condition. This is different from the borough requiring the tree removal. The court stated that the borough’s attempt to apply the same section of borough code to this situation – “violates the ‘fundamental rule’ enunciated by our Supreme Court ‘that an ordinance must establish a standard to operate uniformly and govern its administration and enforcement in all cases, and that an ordinance is invalid where it leaves its interpretation, administration or enforcement to the unbridled and ungoverned discretion, caprice or arbitrary action of the municipal legislative body or of administrative bodies or officials’”. In short – how a law is worded really matters. If you need any more evidence, just look at what is happening to some poorly crafted executive orders in Washington. Borough Councilor Greg Marlovits, who also chairs the Shade Tree Commission, was quoted by the Herald in 2015 that Mrs. Bassett’s issue was an example of the “first-world problems” that consume much of the time of Edgeworth officials. It’s both ironic and unfortunate that the universal ‘problem’ of human mortality serves as a postscript to her victory. Mrs. Bassett, who had owned the property on Oliver Road for over 40 years, passed away on New Year’s Eve. Her obituary listed surviving relatives from outside the local area. When asked about any plans that Mrs. Bassett’s heirs may have for her property or the trees, the law firm representing her in this dispute declined comment. Multiple voice mails left for Edgeworth Borough Manager John Schwend were not returned, either to myself or to the Sewickley Herald, which reported on this in their February 9 print edition. The reticence of both parties likely signals that the dispute has basically ended with Mrs. Bassett’s passing. While I extend my sympathies to her family, I believe it is also important to recognize another recent triumph (see Larry Oswald) by an area landowner over municipal regulations that are ill-crafted and/or poorly administered. 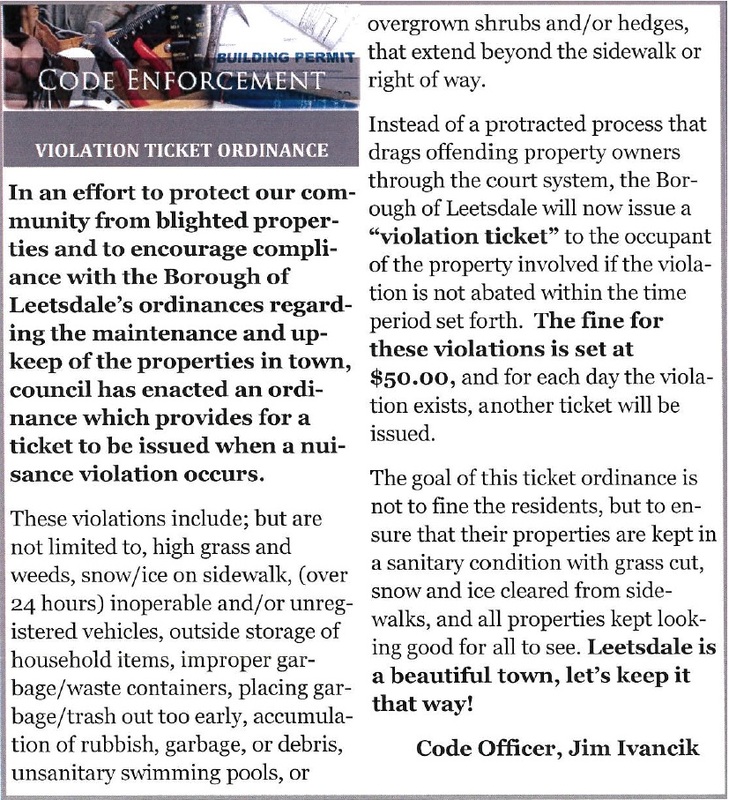 In August of last year, Leetsdale Borough Council passed an ordinance that establishes a new system of ticketing both property owners and tenants for violations of borough ordinances concerning code enforcement and conditions of properties, such as snow removal, excessive grass and weeds, and general upkeep. Excerpt from September 2016 Leetsdale Borough newsletter. The new law provides the borough a self-administered means of enforcing its codes and ordinances, independent of the Magisterial District Court. It also enables borough officials to cite tenants, instead of just the property owner. This past September I approached Leetsdale Council regarding what I thought were several glaring omissions in the ordinance, related primarily to a citizen’s right to due process of law. There was no procedure defined in the ordinance for anyone who might have the “audacity” to contest a ticket, and how that appeal would be received and administered by the borough. Last month, council approved a policy document establishing an administrative process for tickets issued under the new ordinance. It also includes a requirement that photographic evidence of violations be obtained, and requires an explanation be provided if photos are for some reason unavailable. Full disclosure – the photo evidence requirement was my idea. Council President Wes James invited my input into the development of the process, which I provided. Not all of my ideas were incorporated into the final document, but I appreciated the opportunity to be able to contribute. Even if Otto von Bismarck was right about laws being like sausages (“it is better not to see them being made”), local government works better when an informed and engaged citizenry take the opportunity to participate in how their communities are governed. While I remain unconvinced of the ordinance’s potential effectiveness, at least those impacted by enforcement will get some reasonable semblance of a fair hearing. Additional research into Leetsdale’s ordinances also revealed one that has been on the books for over 10 years, but whose provisions have recently fallen into disfavor due to misapplication elsewhere. Chapter 230-3, Section F of the Leetsdale Borough Code, enacted in 2006, establishes a mechanism by which a landlord can be forced to evict a tenant after the receipt by the borough of three “disruptive conduct” reports within a calendar year. This “three strikes” approach fell under scrutiny, and into disfavor, after the ACLU of Pennsylvania sued the Borough of Norristown in 2013 over their application of a similar ordinance that threatened a female tenant and her landlord with eviction and fines over three 9-1-1 calls made for assistance due to the woman’s boyfriend attacking her – the last time putting her in the hospital, due in part to her perceived fear of eviction if she called for help. Despite the law and publicity generated by the ACLU suit, municipalities continued to attempt enforcement of these types of ordinances, according to a Post-Gazette story from 2015. In the years I have been involved with this ordinance in different municipalities that I have worked, it has never been used in the context that it was used in your referenced litigation. It is in place to ensure that neighbors and other persons of reasonable sensibility can have peaceful enjoyment of their premises. The Borough, the police department and myself are highly empathetic in the use of this ordinance and understand the effects this ordinance may have on the Borough residents. While I applaud Mr. Ivancik and other borough officials for their stance in this regard, there is no guarantee that this approach will remain in force under future borough administrations. Edgeworth’s experience with the courts would seem to send a cautionary signal to governments that do not administer their laws uniformly. One also need look no further than the change of power in Washington for another example. I hope that Leetsdale council will see these developments as an opportunity to re-evaluate laws that are no longer enforceable, and repeal or revise the ordinances involved. I’ve been following with interest the arrival of Thomas Tull and his family into the local area. From his purchase of “Muottas” and surrounding acreage in November 2015, Mr. Tull and his representatives have been busy – especially of late. November 2015 – Thomas Tull, as the Three Rivers Trust, purchases “Muottas” and surrounding acreage in both Edgeworth and Leet from Dr. and Mrs. Harlan Giles for $5.5 Million. December 2015 – Mr. Tull creates controversy by filing for a demolition permit with Edgeworth Borough to take down the historic house. January 2016 – Perhaps in response to the community outcry, Mr. Tull announces his intent to move “Muottas” to another site on the property, and build his new house on the site of the old one. March – May 2016 – Mr. Tull makes purchases additional properties for $1.5 Million that will connect his existing land to Camp Meeting Road. June 2016 – Operations begin to clear trees and construct a roadway connecting Camp Meeting Road to the site of the proposed construction and house-moving. July 2016 – Leet Township’s Zoning Hearing Board, before a standing-room audience, conducts a hearing July 11 on the application by Mr. Tull to establish a “gentleman’s farm” on his acreage in the township. 11 days later, the application for a variance to build the farm is withdrawn, but construction of a sugaring shack and an apiary continue on a portion of the property near Walker Park. August 2016 – Mr. Tull purchases “The Farm” in Robinson Township, Washington County, for $3.65 Million. January 2017 – The new farm operation, re-christened Rivendale Farms, is profiled at length along with an interview with Mr. Tull in a January 8 Post-Gazette story. Mr. Tull describes the property as a “working farm”, and indicated that his family would not be residing there. The operations as described in the P-G story certainly give that impression. “We love the Sewickley community but when it became clear that some of the things we wanted to do wouldn’t be a good fit, we pivoted out of that,” Mr. Tull said. A foundation was also poured for a new modern house for Mr. Tull, his wife Alba and their three children. In November, Mosites Construction Co. stopped building the house. February 2017 – The P-G reported on Valentine’s Day that Mr. Tull purchased the nearly 15,000 square-foot house built by Glen Meakem in 2007 along Woodland Road in Edgeworth. This house was built on the site of the 1854 Thomas Leet Shields house and surrounding outbuildings, which were demolished for this newer construction. Included with this reporting is information that Mr. Tull intends to place the relocated “Muottas” and surrounding acreage on the market “soon”. This does not include the sugaring shack or apiary, which are on a separate 42 acre parcel with the owner listed as 76CHSUGAR LLC. This may refer to the reported partnership between Mr. Tull and former Steeler Chris Hoke in the operation of this facility, as well as Rivendale Farms. The latest P-G story included recent photos of “Muottas”, moved to a new foundation but missing the large porch that adorned the house in its original location. Perhaps this will be restored in the future by whomever acquires the house. One can hope that those in the community that remain committed to historic preservation will continue to monitor activity involving this property, and that more local governments will seek to codify the preservation of historic properties within their boundaries. The saga of acquisition, construction, relocation, and now what amounts to abandonment is almost dizzying in both the speed and expense involved. Along with the now-postponed construction of the new house where “Muottas” once stood will likely come the cancellation of significant sewer improvements for the property and through the Lark Inn Fields subdivision of Leetsdale. 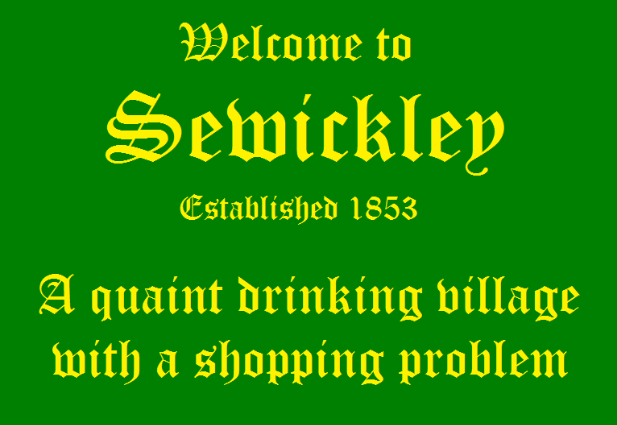 Despite all this, I wish the Tull family a warm welcome to the Sewickley Valley. Hopefully they will enjoy Mr. Meakem’s house as much as they would have enjoyed their own. Perhaps when we take in a movie at the Tull Family Theater, or enjoy a breakfast that includes locally sourced honey and pure maple syrup, we can then truly appreciate the contributions made by their arrival to this area thus far. As it happens, we actually did get to see a movie during opening weekend at the “Jethro”. 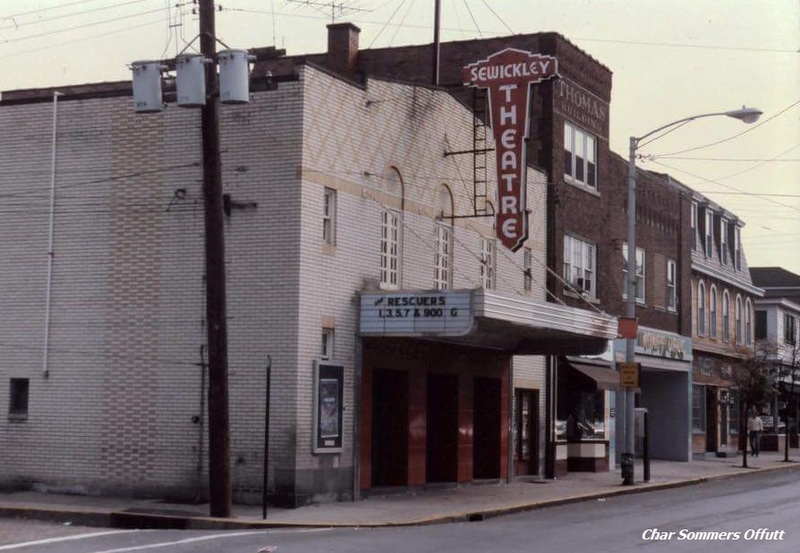 As one who remembers when Sewickley lost its movie house, having one again will hopefully enhance the character of the community for years to come. I’ll have more to say next time. As readers of the Herald have been reminded by full-page ads in recent weeks, “character matters“. I’ll have more to say about that as well in the weeks ahead. Sewickley’s future is inexorably tied to its past – we all need timely reminders of this fact. To conclude on a positive note, this corner has also followed with interest the exploits of Leet Township teenager Elise Truchan, and the saga of her treehouse. This week’s Herald features Miss Truchan making the most of her experience, by teaching others about doing the same. Congratulations to Elise for continuing to make lemonade out of the lemons served up by her local government. Well done. I hope that your holiday season was joyous and uneventful. It’s been quite a while since I last posted here, and by many accounts since then our world has changed dramatically with the results of November’s election. I was upset with the outcome, more so than any election that I can remember. Granted that we had two extremely flawed candidates, but the winner is argumentative, unqualified, and is surrounding himself with people who do not have this country’s best interests at heart. 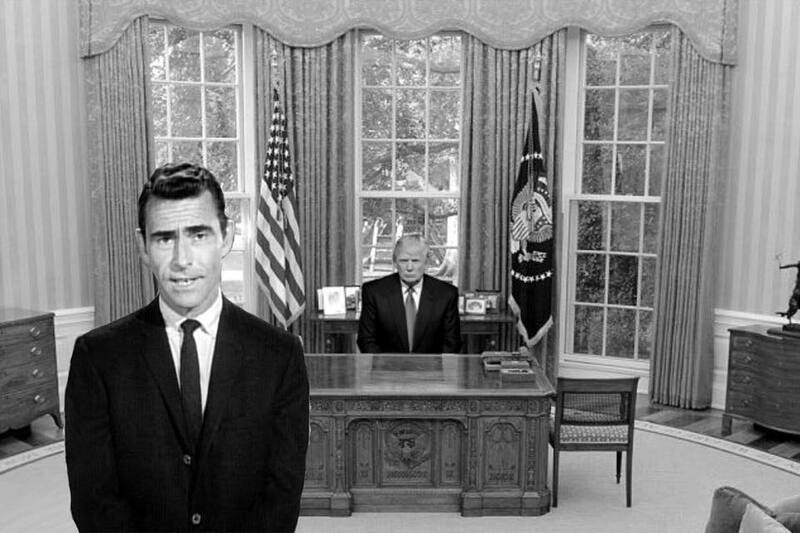 Mr. Trump can be, and will be, manipulated by these people, and we will be the worse for it in terms of our standing in a world that is increasingly shrinking. Ironically, it was us that did the shrinking, by pioneering mass communication and computing technologies that have made the world smaller via instantaneous, almost ubiquitous global communication. According to noted author and New York Times columnist Thomas L. Friedman, we have also facilitated the “flattening” of the world through our development of data networks, satellite and other connectivity, and an Internet to bring it all together. My personal dread derived from the obvious fact that it’s not only the software writers and computer geeks who get empowered to collaborate on work in a flat world. It’s also al-Qaeda and other terrorist networks. The playing field is not being leveled only in ways that draw in and superempower a whole new group of innovators. It’s being leveled in a way that draws in and superempowers a whole new group of angry, frustrated, and humiliated men and women. Those “angry, frustrated, and humiliated men and women” just leveraged the democratic process to put into power a group of people who will do serious damage to the fabric of our nation, unless they are challenged at every turn toward intolerance, warmongering, and the dissolution of human rights and civil liberties gains hard-fought for over the last 60 years. My biggest fear? Economic conflicts with Russia, China, and others escalating into war, and the reinstatement of the draft in response to it. For now, I defer to others with more time and diligence who follow this. I will say that like many other citizens I have made a contribution to the ACLU. Before going back to the local beat, some words for my congressman, Tim Murphy – Nice job on the mental health bill. I’ll be watching your voting record very closely from now on. The For Sale signs in front of two houses in the 700 block of Beaver Street in Leetsdale is but one tangible indicator that the Quaker Valley School District is moving in earnest to find a place to construct a new high school building. The district has retained education planners and design consultants to gather input from the community regarding a new high school project, which according to other reporting may require upwards of 42 acres of land. The existing vacant land at the high school, such as the athletic fields, are not suitable according to the district as they are part of the 100 year floodplain. For me, this is sounding very much like a suitable tract of land may not be available within the district’s borders, and that QV may have to consider obtaining land in a bordering municipality. There is precedent for this in at least two other Allegheny County school districts. I really can’t comment otherwise on the district’s efforts, because I haven’t attended any of the information sessions. I do believe that QV deserves credit for trying to communicate with citizens and garner support through information gathering, and seeking to build consensus on exactly what students need and what taxpayers can afford. Considering the history of previous attempts to build new schools in this district, it’s not going to be an easy sell. More information on this effort can be found here and here. The staff at Quaker Valley High is also taking steps to assure that last year’s yearbook controversy isn’t repeated. In a letter to students obtained via a Right To Know request, QVHS Principal Deborah Ricobelli outlined the process that seems to have as its goal a thoroughly sanitized, more politically correct publication this time around. Ms. Ricobelli advised the students that “a representative group of senior students” assisted in the development of a system that includes a democratic process by all seniors to select submitted quotes for inclusion in the senior photo section. Considering the relatively early deadlines associated with assuring that the printed yearbook is in the hands of students before the end of the school year, I’m wondering if this “separate senior section” will be a companion to – not part of – the published yearbook. This could be something that can be more easily forgotten in posterity should controversy ensue once again. Mentioned more than once in all this is a key admonishment – “The school reserves the right to omit any inappropriate quotes.” Once again, “inappropriate”, like “reasonable”, is in the eye of the beholder. Considering the gems of wisdom that left the lips of our President-Elect during the campaign, the bar of “inappropriateness” may need to be set in an entirely different fashion in the years to come. Camp Horne Road reopened just before Thanksgiving. During the closure, several businesses who felt a serious impact as a result of the work made their feelings known to local media. These complaints dovetailed with the 10th Anniversary of an event that affected traffic patterns in this area in a catastrophic manner – the huge landslide at the former Dixmont State Hospital site, which at the time was being redeveloped into a Wal-Mart. Had I noticed this anniversary approaching, I might have done a bit more research and posted something about it, as I was not living here at the time and would have loved to have learned more. Having read several other media accounts over the years, the biggest impression I got from it was a vocal community activist group saying “we told you so”. A comprehensive 2008 report from the Pa. Legislature details the scope and impact of the slide, the response to it, and the concerns of the surrounding citizens and community in advance of it. The site today appears to have been completely mitigated and stabilized, as best as engineers and other experts can. It serves as a sort of quiet monument to the dangers of unbridled, ill-advised growth for growth’s sake. 40 years ago I was a junior at Quaker Valley High, working after school during the holiday season at the old Select Food Market at the corner of Beaver and Division Streets in Sewickley. This space now hosts Clearview Credit Union, a dance studio, and the Sharp Edge Bistro. I remember several interesting people who worked with me there – a classmate from school, the owner and his son, and the grocery manager, who at the time was Chief of the Fair Oaks Volunteer Fire Department in Leet Township. There was a police scanner in his office in the back of the store, tuned to the Beaver County fire dispatch channel. Back then, every siren and pager for all county fire departments were tested at 6:00 PM – every night of the week. The succession of radio paging tones took several minutes to complete – I coined it the “carol of the bells”. Leet Township and neighboring Bell Acres Borough were part of that “bell choir”. Despite being located wholly in Allegheny County, these two communities have utilized Beaver County dispatchers for at least the last 40 years and well before. The reason for this was likely the historically established population centers of these two towns being focused in the Fair Oaks area of Leet, and along Big Sewickley Creek Road in Bell Acres. These areas received their telephone service from Ambridge, and today they sit (along with roughly half of Leetsdale) within the 724 area code. As technological advances have made these divisions largely irrelevant, the arrangement with Beaver County for dispatch services was apparently becoming more unjustified from a fiscal standpoint. Dispatch services for Allegheny County municipalities are provided without cost to them by the county’s 9-1-1 center, which is funded in part by revenue from the 9-1-1 surcharge that is charged on every telephone line. These funds are administered by the Commonwealth, through the Pennsylvania Emergency Management Agency (PEMA). According to Leet Township Manager Wayne Hyjek, Beaver County and Allegheny County were unable to reach an agreement on the transfer of surcharge funds to compensate Beaver’s provision of these services. As a result, Allegheny County began providing 9-1-1 and dispatching services to Leet and Bell Acres on December 8. Full Disclosure: I am employed by Allegheny County as a 9-1-1 Dispatcher. Scanner radio listeners and hobbyists in the immediate area may notice the new locations and responder units on the Allegheny County frequencies, but aside from those changes it doesn’t seem as if anything newsworthy has come out of the transition itself, if the lack of local media coverage is any barometer of that. The change has thus far appeared transparent to citizens, which from an operational and service provision standpoint is a good thing. The Most Exclusive Nuisance Bar Around? The Edgeworth Club describes itself on its website as “a private social and recreational club set among the stately homes of historic Sewickley, Pennsylvania”. Recent actions by Edgeworth Borough Council give the indication that the resident of at least one stately home does not share the club’s enthusiasm for its proximity. ..a neighbor had complained about the noise level emitting from the Edgeworth Club after 10:00 pm. The neighbor threatened to turn the Edgeworth Club in to the PA Liquor Control Board for violating LCB noise regulations which are designed for nuisance bars. (Club General Manager Brett) Ninness stated that he feared the Club may be in jeopardy of losing their liquor license if the neighbor filed unwarranted claims with the Liquor Control Board. Mr. Ninness asked for the Borough to pass a Resolution stating that Edgeworth Borough enforces its own noise ordinance as opposed to the Liquor Control Board. A municipality can actually petition the LCB to have its own noise ordinance replace the nuisance provisions of the liquor code, thus enabling more local control over enforcement. According to Mr. Ninness the application proposed by the Edgeworth Club was being submitted as a defense mechanism for the establishment against unfounded complaints…Chief (John) English also stated that the Edgeworth Club has always been accommodating when requests regarding noise levels have been made by the Police Department in the past. As much as this approach seems to make sense to prevent the potential misapplication of a state regulation by supplanting it with local law, I still have to wonder about the outright dismissal of the neighbor’s complaints as “unwarranted” and “unfounded”. Maybe the resident(s) involved will have their turn before council in the future. 40 years ago this past summer I was working my first real job, behind the counter at the Isaly’s in Sewickley. The store was in the space currently occupied by Bruegger’s Bagels, across the street from the old Sewickley Theatre. One of my most memorable evenings was when All The President’s Men was showing, and the crowd that let out after the early evening screening really wanted ice cream. People were lined up 3 deep, and we didn’t finish up until very late. Before its closing in 1979, the theatre was the anchor of nightlife in “The Village”. When Leslie and I go into Sewickley, it’s usually during the day, although we did enjoy watching a Pens game recently at Sidelines Sports Bar. In about a month, numerous years of planning, fundraising, and preparation will come to fruition as the Village Theater Company opens the Tull Family Theater complex on Walnut Street. Since my post in March on the infusion of $500,000 by the Thomas and Alba Tull Foundation, the theater company has ramped up its preparations, and brought on expert staff and creative leadership as well. Noteworthy to me are the changes in relationships that a healthy bank account can bring. 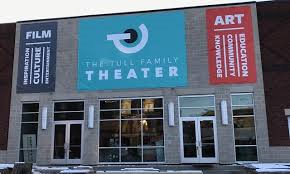 Prior to the Tull Foundation’s involvement, Village Theater Company was reportedly aligned with Pittsburgh Filmmakers, but in the wake of the cash infusion, and reported financial problems at the Filmmakers, the company instead aligned themselves with the same film programmer used by the Manor Theater in Squirrel Hill. Leslie and I visited there earlier this month to see the film Loving. The Manor is an impressive facility with some excellent offerings – hopefully we can expect the same from the Tull theater. The Pittsburgh Filmmakers do deserve much credit for their continued offerings at their various venues around town. I drive by the Regent Square Theater regularly, and got a smile from their recent week-long showing of the holiday classic It’s a Wonderful Life – for free, with a suggested donation of food items that took up one side of the theatre lobby. It was one way for people to enjoy this great story, and do something for those in need, before Mr. Potter moves into the White House. While our main source of independent film viewing is just down the street at the library, I’m anticipating that we’ll be able to take in a film at Sewickley’s much-awaited new venue. I wonder if the new Crazy Mocha across the street will be ramping up their staff in anticipation of post-movie foot traffic. There’s plenty more to say, and perhaps a reboot of sorts is needed here in response to what is about to happen with our national government. I’m looking forward to facing the joys and challenges of life in the coming year, whatever they may be.